Even though there was a light dusting of snow last night (enough to fill a teacup), the sun is out today and the blue sky makes it feel as though the true winter is almost over. 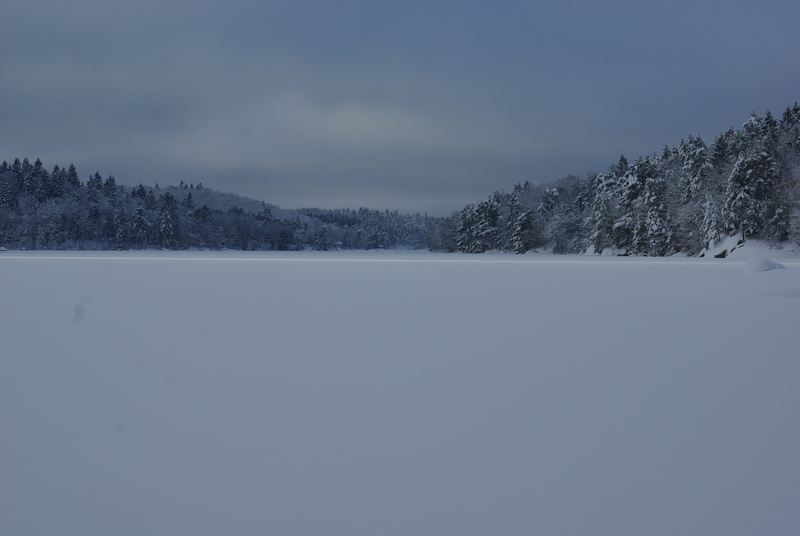 There will be clouds and rain and cold, for sure, but not the drifts of snow and frozen lakes that are a ‘real’ winter. Today then seems a good time to show you all a little bit of the winter that was just passed, the sort of winter that I love. Snow had been falling off an on for weeks, bending down the trees under the soft, dense weight and freezing the lakes nearby. 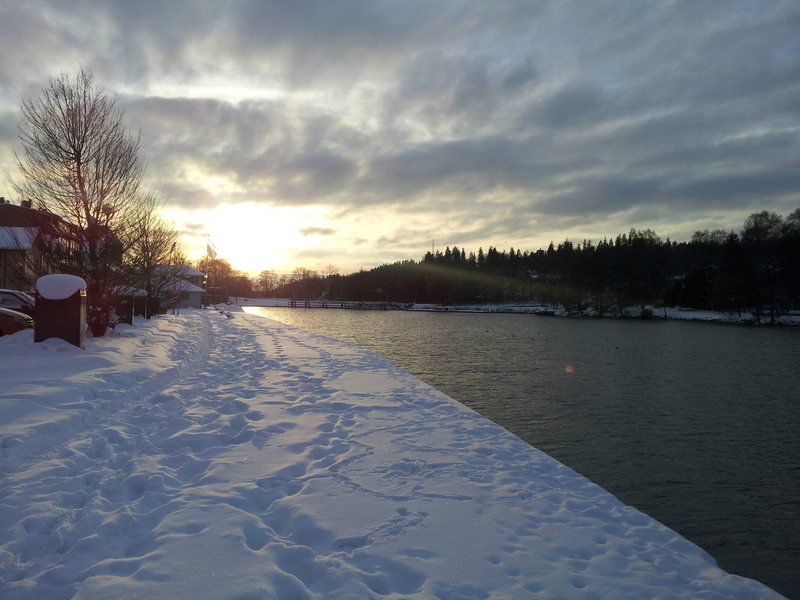 While snow is in itself beautiful, the moment it comes alive is when the sun comes out. One day we went for a walk on a weekend morning, and more than once I was quite literally stunned into stillness and silence by the beauty of the trees, light and snow. Branches sticking up through the snow were coated in a thin, shining layer like crystals, which drifted lightly off when flicked. 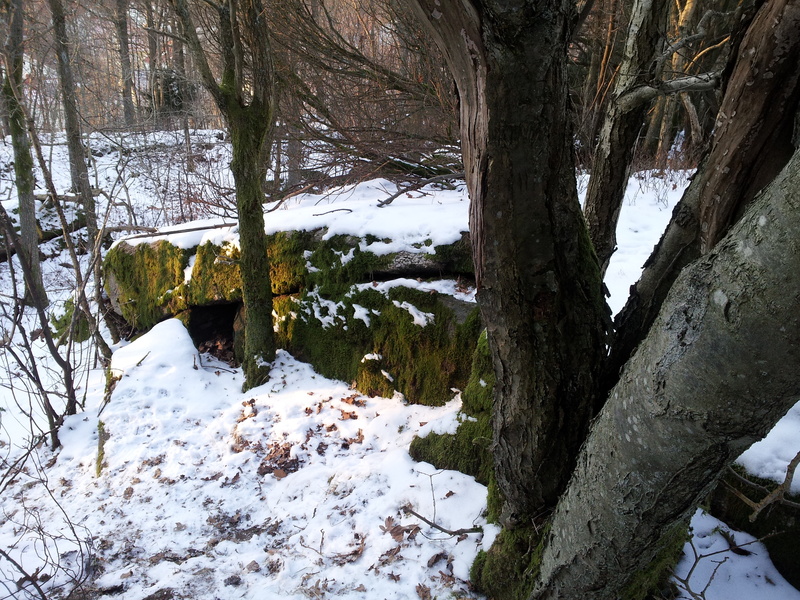 The forest, where not so many months ago we had picked berries, was muffled and still, though at any moment I expected a breeze to tumble a branch load of snow onto my head. 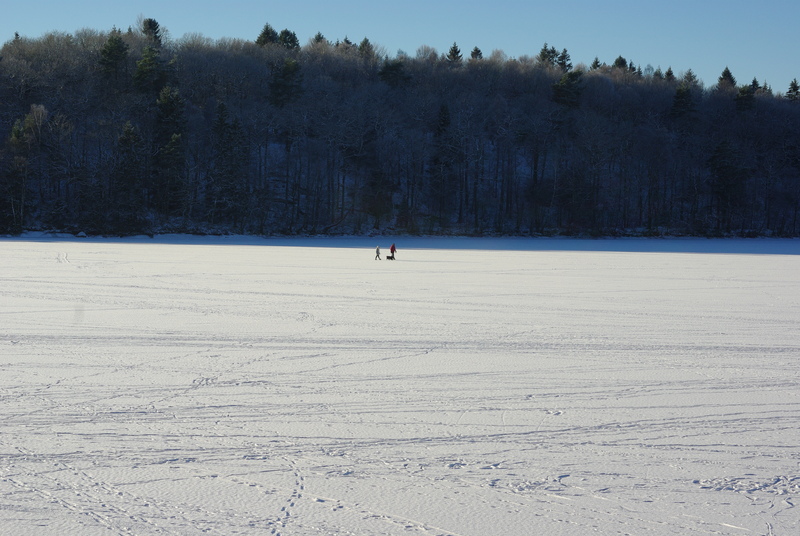 After my fella returned home, I continued on to the nearest lake, wondering if it might be frozen. It was was, very much so. Not only was it frozen, which a layer of snow covering the thick (so I hoped) ice, but it had been transformed into a park, or to my romantic mind, a winter wonderland. 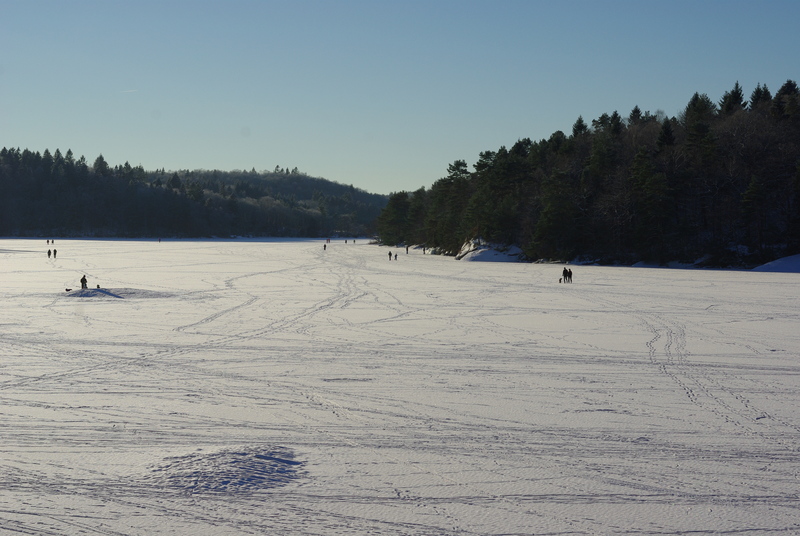 Children scampered about in their fleuro one-piece outfits, adults walked their dogs and people of all ages skated and skied, leaving long, crisscrossing tracks behind them. Nervous at first, I walked over the tracks, listening for the creaking of ice and then walked more and more confidently across to the island that 2 years ago I had swum to. 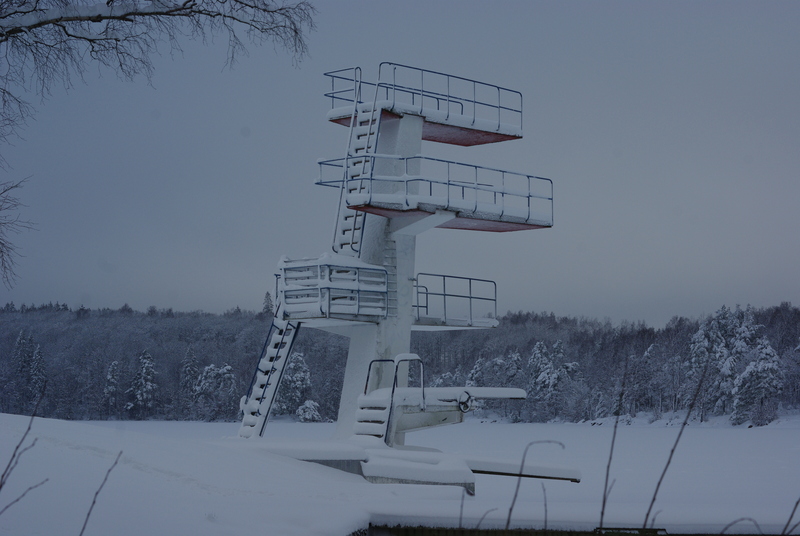 Under wide, bright blue sky and in the centre of the vast openness of the lake, the claustrophobia of winter fell away, down into the freezing, dark water under the ice. On the shore nearest to the houses, areas of the ice had been cleared and with shoes or picnic baskets for goal posts, ice hockey games were underway. Often it seemed the dads were ahead, but now and then a son or daughter would sneak past and a parent dramatically fall over, equaling the score. 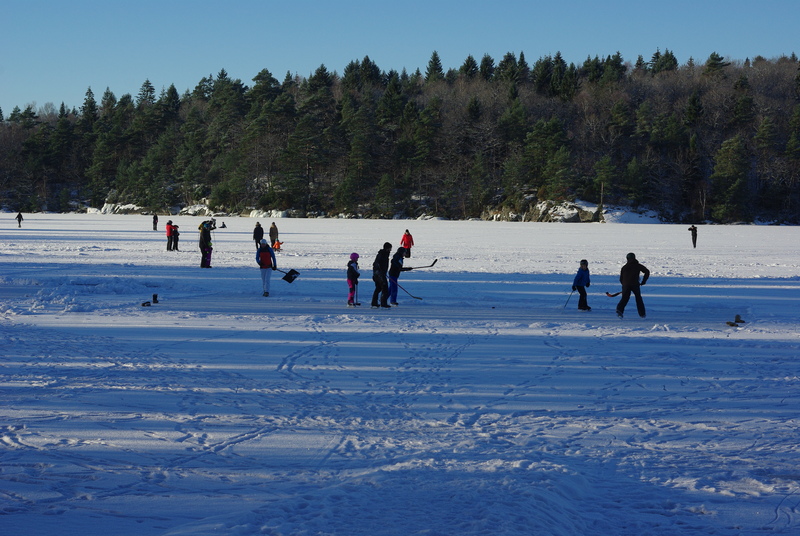 In sheltered bays little children were being taught to skate, knees locked in fear and well padded bottoms covered in snow. In the distance, old couples walked their dogs, disappearing into the further reaches of the lake. If there was ever a heaven of ice and snow under a low hanging northern sun, this was it. Then later that week a storm hit the west coast of Sweden, bringing wind and snow. A lot of snow. By the time it had ended, there was 30cms of it in our neighbourhood, and enough in town to stop trams, buses and cars. It was, in the words of frantic sensationalist newspapers, SNÖKAOS, which I think doesn’t need translation. This resulted in many people not getting in to work, including my fella, and one of my all time favourite news bloopers. My lesson for the day had been cancelled, so after a few productive hours of work we set off for the lake, my eagerness to show off the beauty and novelty of walking across it pushing me through drifts up to my knees that hadn’t yet seen a shovel. Though there was no sign of the sun through the thick clouds and the snow-wading was tiring us out, we reached the lake before too long. 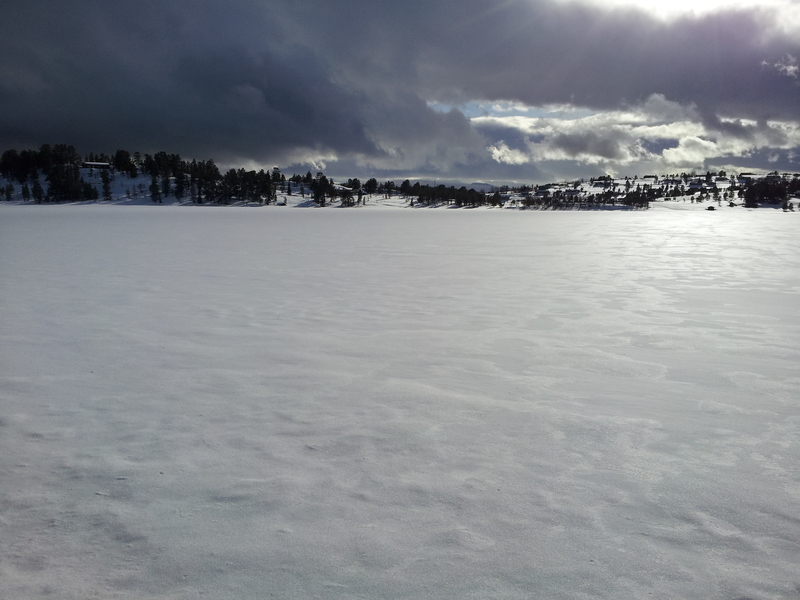 It was still frozen, also covered in deep snow, but as yet without any tracks or trails over its surface. Coaxing my fella out into the open, we made it to the island and sat to contemplate the wide openness, and quiet. 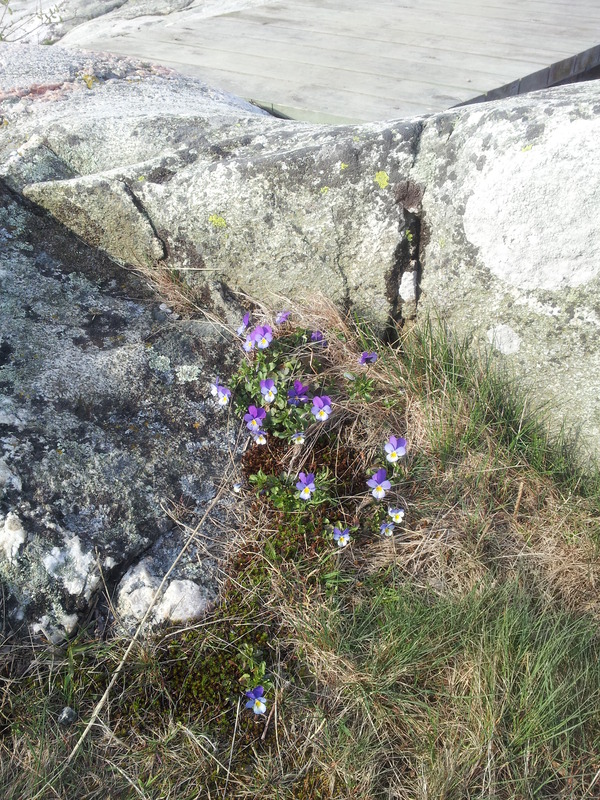 Still beautiful, it seemed a more severe and solitary beauty than I had seen myself on the sunny day so recently. Since then the temperature rose, rain fell, the snow melted into slush and then washed away, leaving only patches of black ice to tread carefully around. We might still get snow, but the day of minus temperatures and nights of -18 seem behind us now. The question isn’t how much snow do I need for a snow man, but when will the first flowers start to bloom? 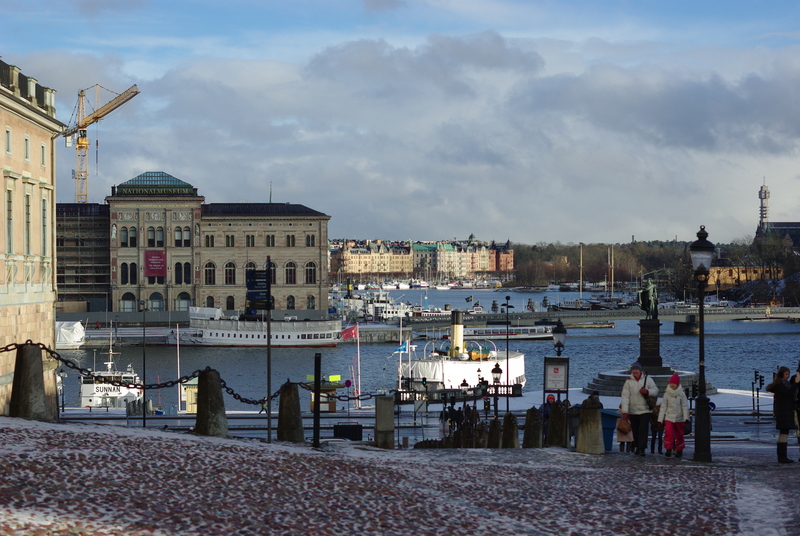 For us folks from little old Göteborg, it’s always a bit of a jolt arriving in Stockholm as you climb off the train and are soon enveloped in masses of bustling folk, tourists, locals going to and from work, locals between pubs, beggars and others whose intentions I could not guess. So it was this latest time, as I met my partner at the station. As I mentioned in the previous post, my mum had already arrived and my fella had just finished a day of work, so all that remained was for both of us to make our way to the house where we would be staying. We joined commuters on the pendeltåg to Uppsala (one day I’ll follow it the whole way), and after a wander and a bus ride we arrived at our stop. My mum found us there and before long we were unloading our baggage at the guest rooms and I at least was starting to relax a bit. After a little refreshment, we went to the home of one of my mum’s childhood friends, the lady who had arranged for us to have the guest rooms. We were welcomed into warmth with wine and conversation, and soon felt at home. We would end up spending the beginning and end of the next few days at her home, and I think we took the ‘make yourself at home’ line to heart. We had a delicious, cosy dinner followed by lots of chatting and finally, as my eyelids began to droop, we went back to the guest room and rested. The next morning my partner went off to work early, but my mum and I took our time getting ready, breakfasting at the apartment and planning the day ahead. Around mid-morning we were on a train bound for the city and were soon after wandering the streets of Gamla Stan. After investigating the Palace and taking photos, our first stop was a cafe that had been recommended by the daughter of our host. As she said, there was a sign out the front promising mint tea, which turned out to be everything she had said and more. 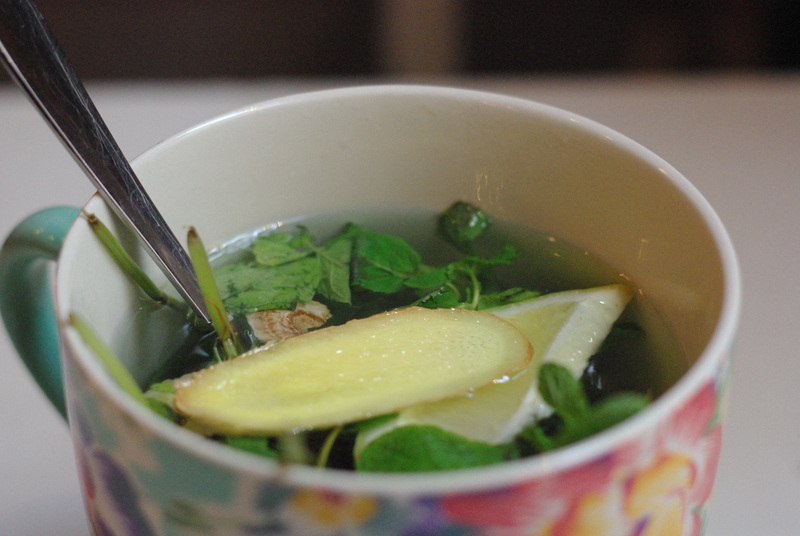 It was basically a large mug filled with handfuls of mint leaves, chunks of ginger and slices of lemon (and after an incident with mum’s drink, a little bit of melted chocolate), and was wonderful. The minty, gingery warmth more than made up for the slight envy I may have had for my mum’s bowl – mug doesn’t cut it here – of hot chocolate. Thus warmed and sweetened, we continued our explorations. We had no plan and so took what streets we found, admiring old buildings, posing in front of the Nobel museum and exclaiming at the rune stone lodged in a wall. 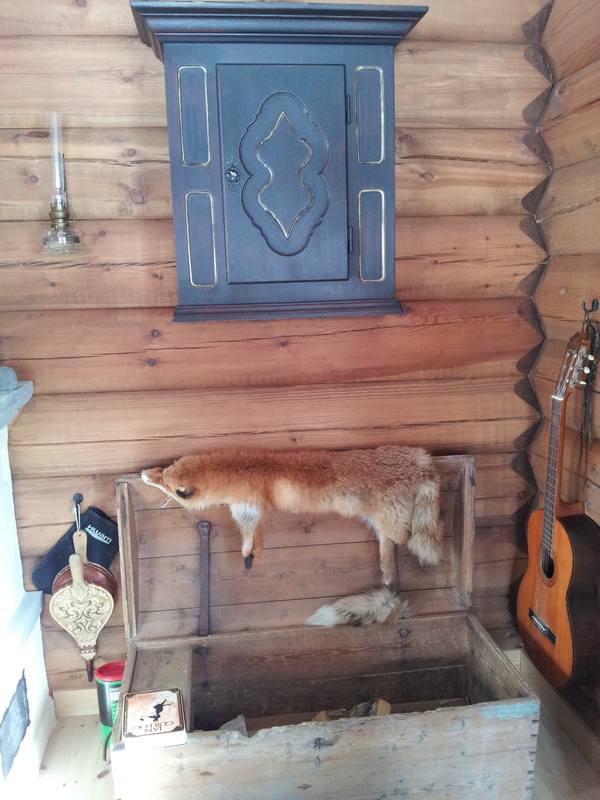 As we finally left Gamla Stan, we had a look around the Medieval Museum, hidden under Norrbro. I’d been there once before, and it was just as interesting this time. We followed a tour guide around and poked around ourselves, admiring the reconstructed houses, monastery, markets and recreations. As before, I was struck by the poignant model of a woman realising she had the plague, and a monk eternally checking his herb garden. Back outside we continued our journey through the busy shopping and business areas of the city, catching a short tram ride to Nybroplan and then finding Östermalms Saluhall. We had a snack and took part in people watching, noting the grandparents with grandkids, old friends, couples and those who ate alone who surrounded our little table. A walk around the hall revealed amazing fish, a remarkably calm elk head, feathered chickens and countless other treats and sights. Back out in the cold we took refuge in design stores and a cafe as we made our way back to the station bit by bit, finally arriving in time to relax before being served another delicious dinner. The first time I visited Stockholm, I also trekked out of the city to visit the suburb where my mum grew up and found her old home. I’d been in a rush, as I got lost on the way, and so only made a note of the concrete pool in the front yard that she’d told me her father had made and thought that it seemed very quiet and un-lived-in. As we approached the house this time, comments about remembered landmarks and friends filled the front of the car – ‘that’s where so-and-so lived’ ‘I saw him three years ago’ ‘what happened to her?’ ‘do you remember the quiet boy at the end of the street?’ My partner and I sat in the back and stared out at the normal looking suburb, rows of similar looking houses blanketed in snow and hills covered in thick forests. We pulled up at my mum’s old house, and after showing off the letter box made by her father she lead us up into the forest. 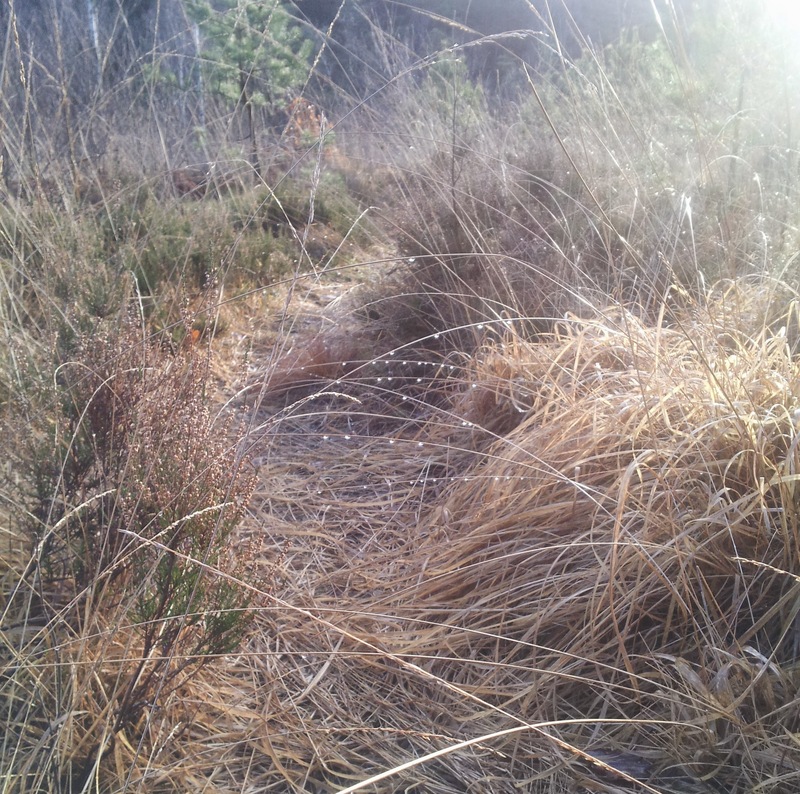 I’d heard a lot about this forest as I was growing up – days of picking berries, building huts, making bows and arrows, playing tricks on neighbours and all of the other pastimes that 4 children can invent away from the interference of adults. 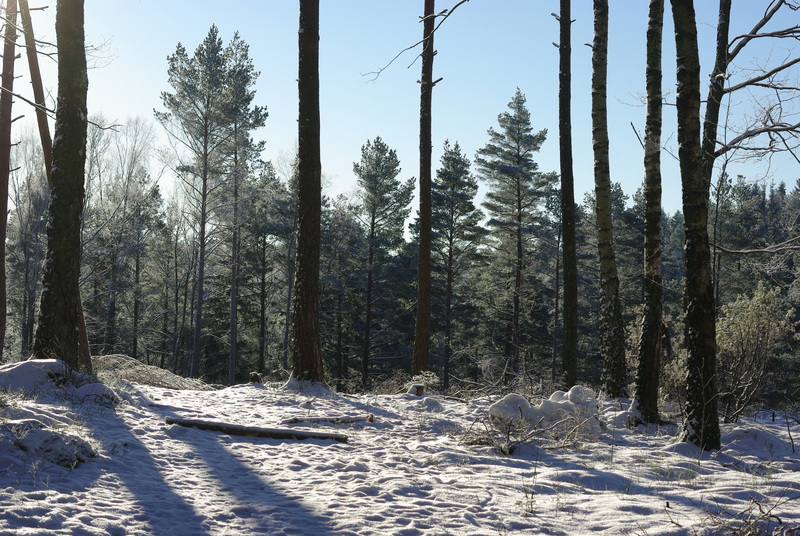 As we picked our way over drifts of snow and around trees she pointed out familiar rocks, a place where they built a hut, the multitude of blueberry bushes, the tracks in the distance where they skied and the path from school. I imagine that as a child the forest would have been as big as a whole world, with endless possibilities and even with adult eyes more suited to measuring and creating meaning I could see the trees that would make perfect hideaways and the borders of the forest seemed to fall away. From the forest we went for lunch at the local shopping centre, which had grown a bit over the years. At the supermarket my mum excitedly grabbed a brochure with the name of the suburb, as alas we had been unable to find t-shirts of the ‘I ♥ ____’ variety. That night was to be a reunion for my mum and a few friends, so my partner and I had the evening to ourselves. Following a recommendation, we went to Medborgarplatsen or ‘Medis’, the most real feeling area I had yet seen in Stockholm. Rather than packs of tourists, it seemed mostly inhabited with locals and though the restaurant where we ate had English menus it didn’t have tourist prices. 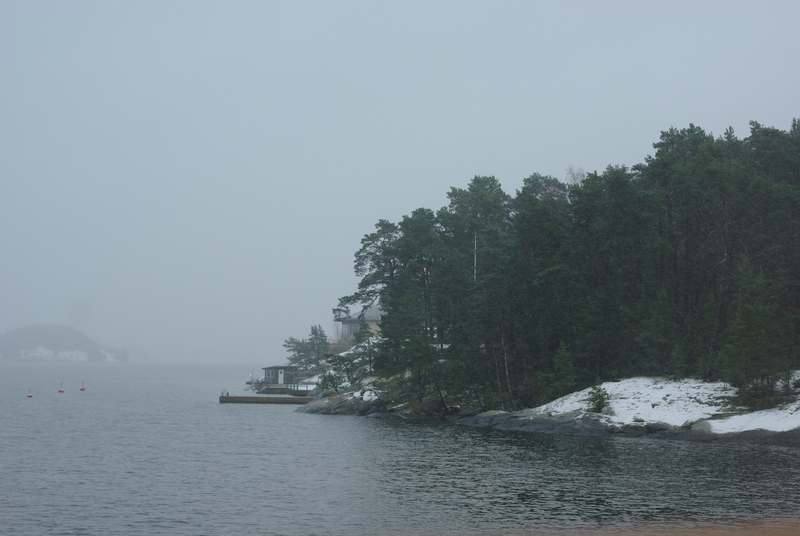 On Sunday morning my partner returned to Göteborg, so us three ladies went on a boat tour of the archipelago. I had last seen it in August on an old steamer, sitting out on the deck admiring the green islands and watching families have parties on their terraces across the water. This time there were no outdoor parties, and much of the greenery was covered in a blanket of white. It was still lovely, however, crisp and clean contrasts of dark green, grey blue and white across the land- and water-scape. The tour included a guide, who punctuated the trip with history and anecdotes, and seemed very excited to find people who could speak Swedish. 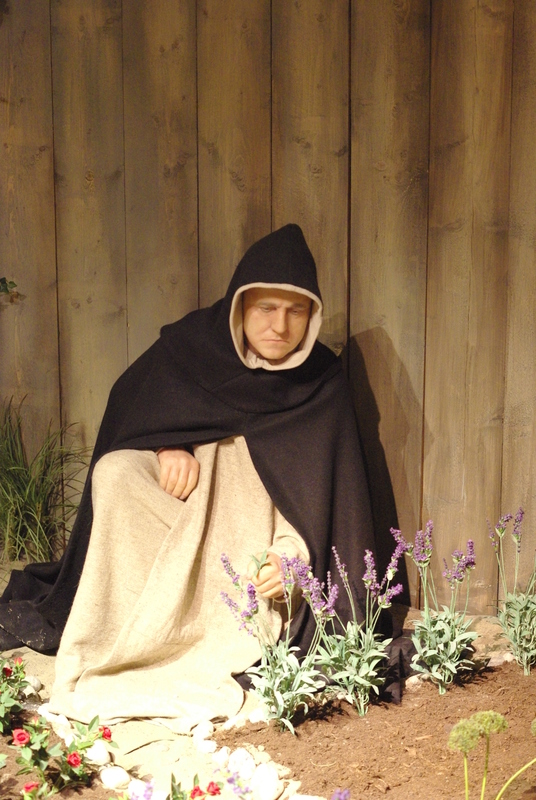 He’d break off now and then and give us a tid-bit that he didn’t share with the others, and despite getting the age of a famous skiier and the Germanic ally who had betrayed the Romans in the Teutoberg forest wrong, he was an excellent guide. Some final wandering through the city followed the tour, and we then headed back to the apartment for our last dinner together. We finished with a dessert that had amazed me so much the other time I ate it that I was given seconds. Who would have thought that fried pepparkaka dough, icecream, blue cheese and fig jam would be the perfect combination? If you take nothing else away from this blog, I hope it is a nagging curiosity about how this recipe could exist and a yearning to try it. On the following day my mum and I both departed, though at different times and to different places. She caught an early train to Oslo, and then on to Lillehammer. 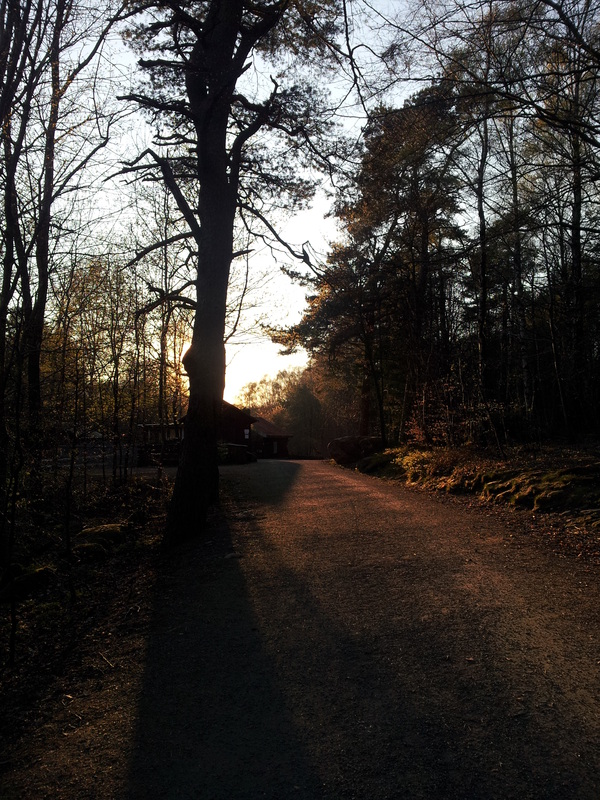 I went later in the morning on a train back to Göteborg to return to what would become normal life. Thus ended the part of my mum’s trip that was spent with us, about two weeks of conferencing, touristing, eating, talking, walking and celebrating. She is now back in Australia, I imagine having long adjusted to normal life and a pretty dramatic temperature difference. Who knows how long it’ll be until she’s here next, exclaiming about snow, showing us how to make Thai food and sharing explorations. I hope it isn’t too long. The day after Jul has always been associated with resting and recovering, at least in my old home. We’d wake up late, have a brunch of leftovers, reorder our rooms with the new gifts, flick through the inevitable books and consider the age old question of whether it’s sensible to float around in the pool on the new inflatable sofa while holding a full glass and avoiding spillage. And how long it would be before my sister bombied in and overturned both the sofa, myself and the glass. For various reasons, not limited to the lack of inflatable sofas and my sister, we had a different day after Jul last year. It was on the 25th for a start. As mentioned previously, I’m used to having Jul on the 24th according to Scandinavian tradition. I am also used to having it again on the 25th, according to Australian tradition, which isn’t followed in Norway. As such rather than two Juls we had two Boxing Days, both of which we spent in Norway. 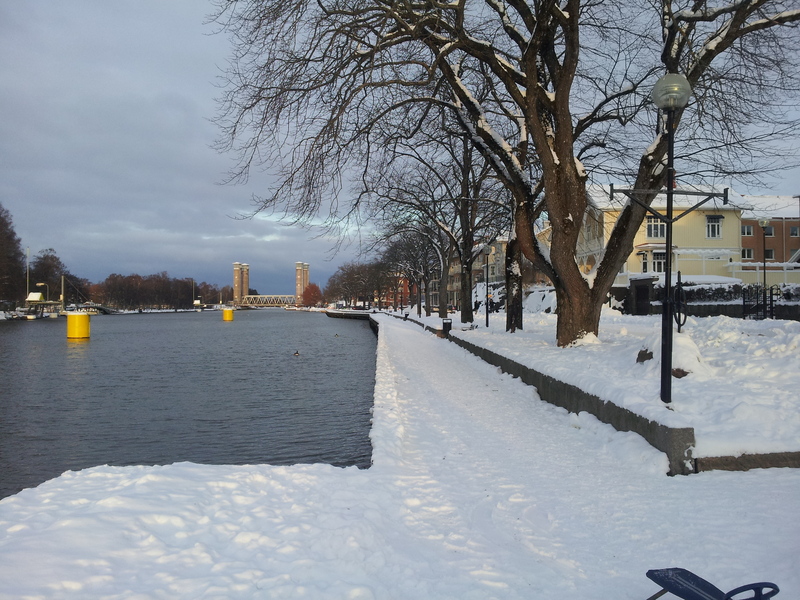 The first was spent recovering from Jul, heading out for wintery exercise and then a family meal and the second getting into a bit more exercise and finally beginning our journey back to Sweden. After we had woken up and refreshed ourselves, we had a chat with family back in Australia. Thanks to the miracle of Skype, we were able to chat to a whole party of people enjoying a sunny bbq, and try to get our collective heads around the 50+ temperature difference at either end of the call. We then packed on layers of jackets, beanies and gloves, grabbed some skiis and went out for some much needed exercise. 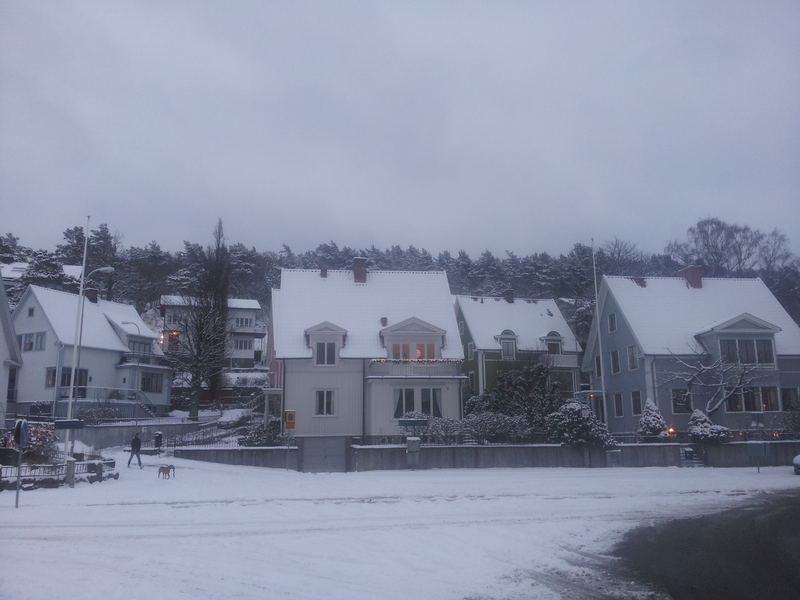 It isn’t the custom in Norway to spend a whole day relaxing when there is snow outside, and it seemed that the rest of the town had the same idea. My own attempts weren’t quite as skillful, but we managed about an hour before we called home for a ride. While we waited I realised that my eye lashes were freezing together for the first time in my life, and my partner was developing long, frosty threads on my beanie and scarf. Around us the sunny weather belied the cold, and almost fooled us into not noticing the cold. Almost. Back at home we unlayered ourselves and dressed up nicely for the visitors who would be arriving soon. They were the family we had met to visit the graveyard the day before, and soon after we had smartened ourselves up they arrived and the Jul celebrations continued. The tradition on this day is to have a long lunch on the leftovers from the Jul dinner and have another go at the schnaps, which is what we all duly did. Chat, food, jokes and laughter rolled around, and soon we found ourselves under the tree enjoying a selection of biscuits, cakes and treats. The eating and chatting continued long into the evening, and then the guests departed with hugs and hopes to see each other again before too long. In the relative quiet by the fire, my partner and I unwrapped the final gifts that had been sent my his family, that we had kept back until the Australian Jul day. 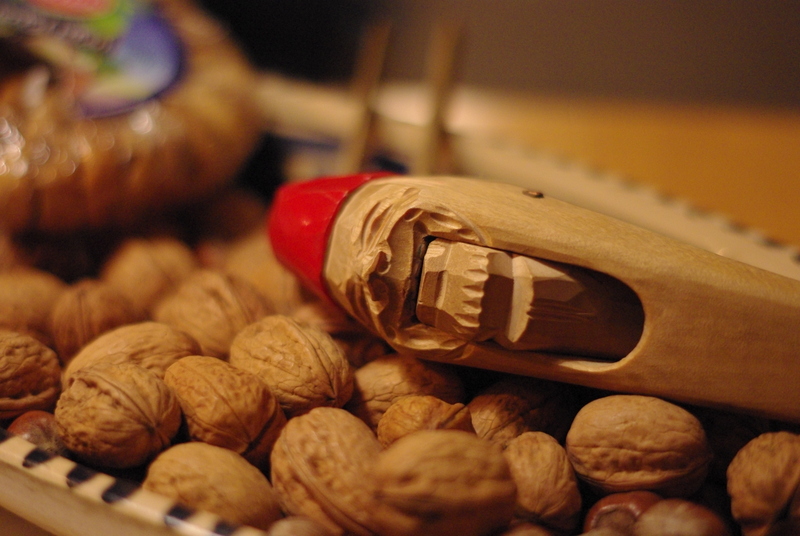 More chatting, sipping wine, playing with the nutcracker, snacking and reading followed, finished off by sleepy goodbyes and curling up for one last night in Norway. On our final day we decided to have one last go on the spark, and see if we could take some photos at Maihaugen, the local open air museum. 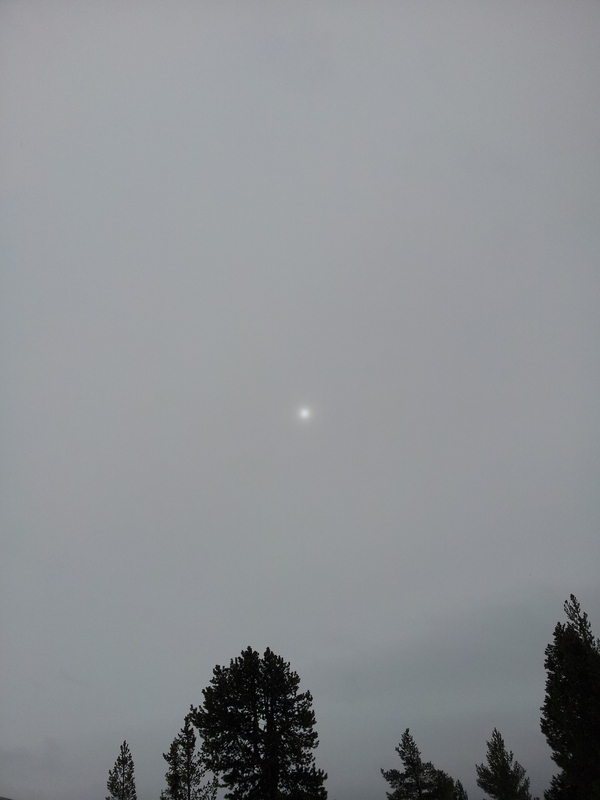 The temperature had dropped even more by this time, and clouds covered the sun, so despite the beautiful surroundings and our energetic walking and kicking along, we were soon chilly. During the walk back my chin went completely numb and I ceased to have any feeling in my toes. We did have fun sliding down slopes on the spark, though and going ‘weee’ in a way that I hope didn’t disturb the neighbours. Before too long is was time to pack and get ready to go, and as we did so snow began to fall, the first we had seen during our trip. So it was with the outside world slightly muffled by falling snow that we said goodbye to our hosts, trying to express our enjoyment and gratitude for the wonderful Jul we’d been invited to share. Then we were out, in the car and then at the station, tromping over to the waiting train. 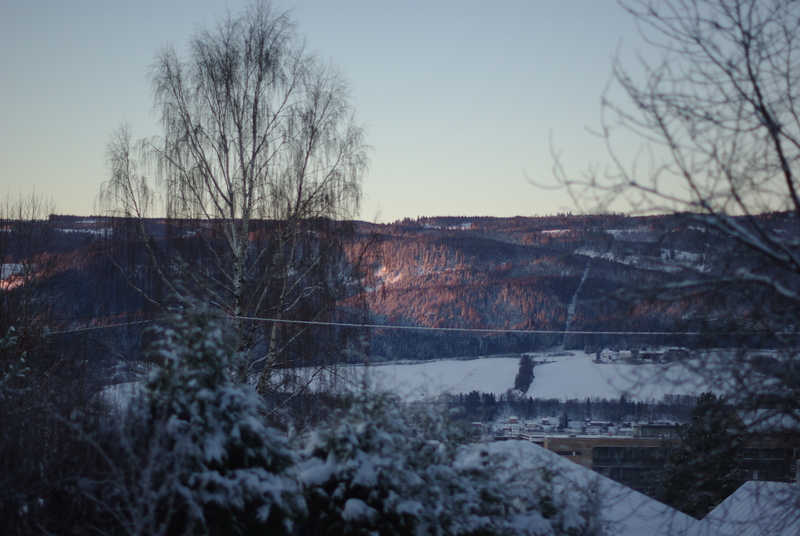 Jul was over for another year, our first white christmas and hopefully not our last. It was one of the loveliest I have had, and I hope that my writing conjures up the memories of it for you as writing it has done for me. Just last weekend my partner and I went on a journey. 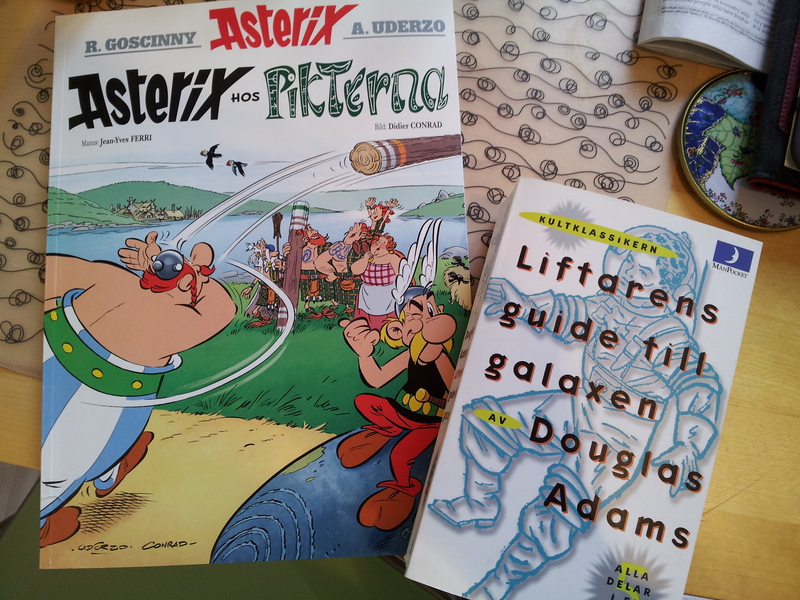 There was at least a week of preparations, involving packing, bookings, packing books and measuring things. Things were sorted, some things were chucked out and things we had forgotten about were discovered under other things. It was… not exciting but it kept us busy. Finally the big day arrived, and with the help of a very helpful friend we picked up the vehicle we’d booked and began our journey. We started with the bed and the couch, as they were the biggest. Yes, we moved house. I was hoping to drag it out and make it seem like an adventure, but for all those who have moved (which I assume is pretty much everyone..? ), I surmise that adventure is not the word that comes to mind when you remember moving. Maybe ‘argh’ or ‘never again’ or possibly ‘no, not the boxes, anything but the boxes’. At the moment, I’m somewhere between the last two phrases. And we still need to go to IKEA to get shelves for extra books and generally putting things on and lights and everything else. Wee! Ok, sarcasm and drama aside, all the sorting, packing, carrying, cleaning, carrying, unpacking and sorting has been worth it. 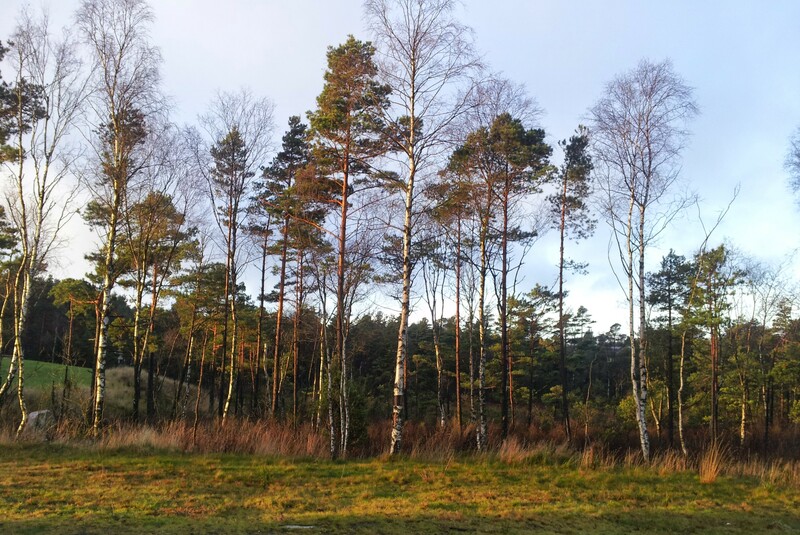 Our new place is new, clean and spacious and during the wonderful and brief few hours of sunlight we have a view of a birch and pine forest out of the kitchen window. And a large kitchen. And a dishwasher. It’s the nicest place we’ve stayed in so far in Sweden, and actually the nicest place we’ve rented together at all, including that one place in Perth. If I had my family over here for dinner, no one would have to sit on the couch arm to eat dinner ever again. As it’s a first-hand contract we can also do pretty much what we like with it, including putting up pictures on the walls, which I can’t wait to do. We can also stay for as long as we want, which feels like quite a luxury. It will give us time to settle in and make ourselves comfortable. And did I mention there’s a spare room, with space for a spare bed? 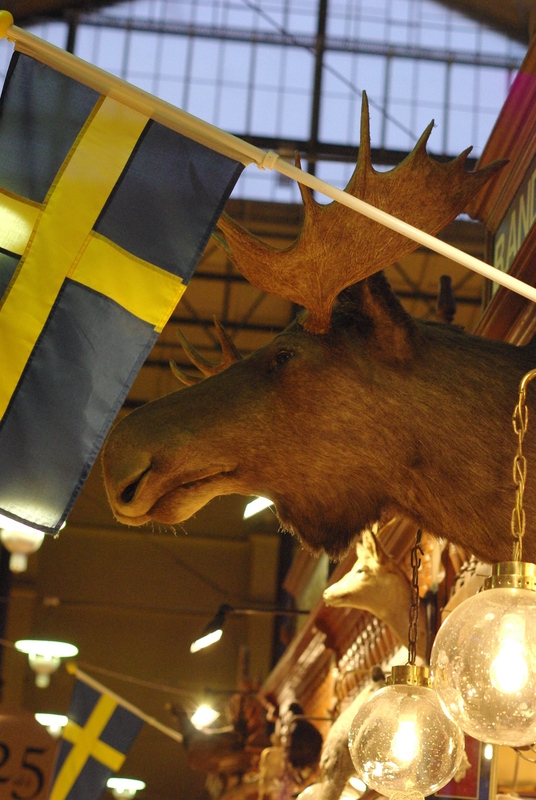 Yes, that is a hint to all of you who have considered visiting Scandinavia at some point. On that note I make great porridge. So while we’ve been planning our move and settling in, the coldward turn of the weather has become more and more noticeable. 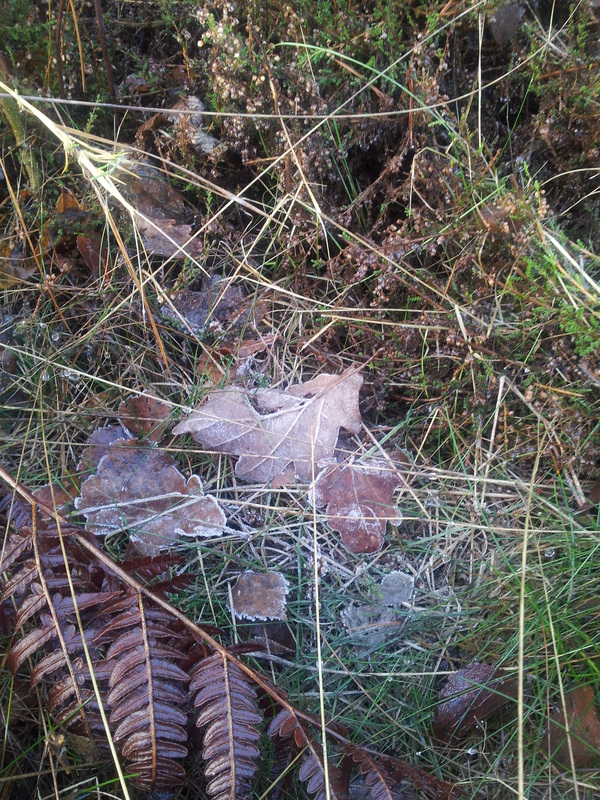 Leaves are frosted over and sparkling in the occasional sunlight, footpaths are slick with ice and the regular rain is really starting to get miserable. All of which means that when there is sunlight, it is glorious. As my previous post demonstrated, a day of sun is something to be treasured and basked in. Not only is it a lovely and slightly warmer break from the dark and cold, but the effect of the sun sliding low along the horizon makes the light even more defined and beautiful. Even big brown office buildings take on a welcoming glow. The birch and pine stands near our new home have been quite beautiful. The darkness has also lead to a certain social pressure that mounts whenever I look out of the window or walk down the street. In every window (I’m not even exaggerating…) there is a triangle of candles, most often electric, and at least one lit up star. We have our own advent candle holder, though I’m not sure how long I can justify not having an electric one. Perhaps this is an even crueler way to troll Swedes than sitting next to them on an empty tram: not putting up advent lights. Soon, very soon. Soon will also bring Lucia, Jul and New Years, and vising friends and family and birthdays. I think with all these things to look forward to, the darkness won’t seem quite so cold. To complement the hordes of articles that seem to be popping up in newspapers and magazines lately about how to deal with the oncoming darkness and not go crazy, I thought I would add my little bit of advice. I have learnt it through a combination of instinct and necessity, and unlike pretty much all of the advice that others seem to be spouting, it doesn’t involve leaving the house. Or even the kitchen. And you eat it. My home town in the middle of November at 3:30pm. On a nice day. It started some time ago, when I realised that this whole making bread thing isn’t as hard as I thought and that if I make bread my partner gets a bit giddy with excitement. 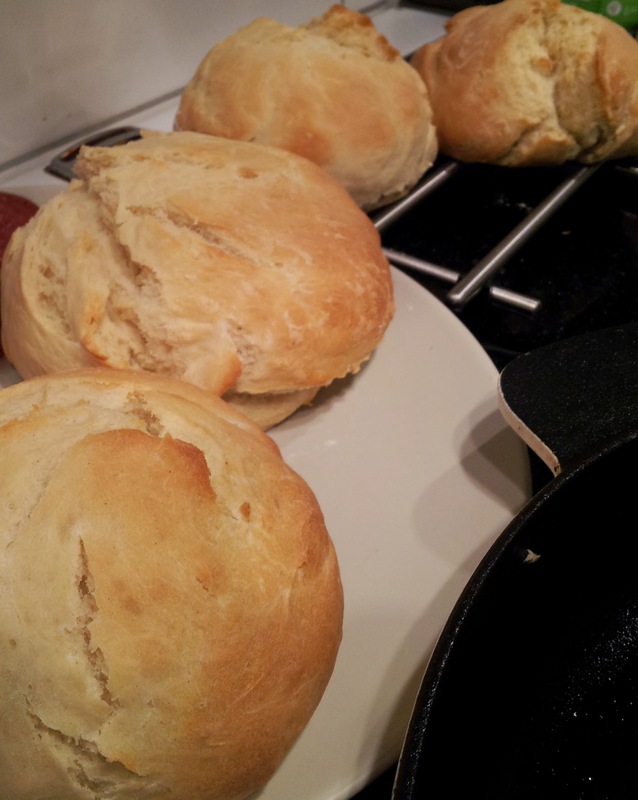 I found an amazing recipe that makes bread rolls in about 45 minutes, from start to finish. And they are perfect. I’ve done it three times now and both times there was a sense of a miracle as I took the tray out of the oven. The second time was also the time when I realised that this baking thing was becoming a thing. It was halloween, and as mentioned in that post, I decided to do some traditional, themed baking. There was the Roman dish, soul cakes and the bake that was not quite a cake. It was the first of my recent failures and it stung. A few weeks later I decided to use the scrapings from the halloween pumpkins to make pumpkin bread for book club. It… did not work. We agreed that it made decent slice though, and left it at that. I brought tiny vegemite sandwiches to make up for it. However I kept going, making another delicious pile of rolls (oh the burgers, oh the joy), and it started to creep up on me that there was a pattern in my behaviour. I’d wake up, do weekend things and somehow find myself in the kitchen, wearing an apron and spraying flour dust around the counter, while outside the sky lowered and rain fell. The oven would be on and though kneading and cries of ‘oh damn, why is it still sticky!’ lay ahead, I knew at the end would be something warm and comforting, and edible achievement that perhaps in some way made up for the cold and inability to picnic. It was around this point that we began to get creative. By now my partner had decided he wanted in on this baking thing, and not just as the happy recipient of baked goods. Prior to my baking revelations he had been the house baker, proud owner of the knowledge of how long to leave the yeast to grow and at what temperature, how elastic the dough should be and how many times to punch it before baking. And he does certainly make very fine bread. 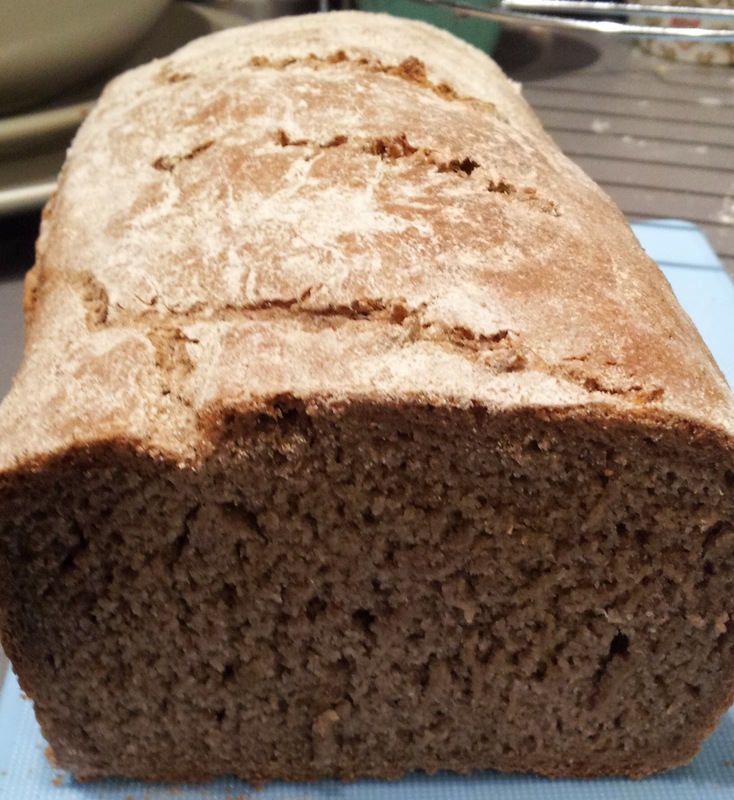 So when I said that I was curious about making rye bread he fiddled on his tablet and replied soon after that he might be interested in making barley bread, using ancient recipes. So after a trip to the shops for the correct flour and extra yeast, the bake-off was on. Except without officially being a competition, because I don’t like competitions. And neither of us are especially graceful losers. We set to in the kitchen, wearing our respective aprons and were soon thoroughly dusted with flour. There was much kneading, poking, tutting about consistency, watching dishcloths slowly rising and finally carefully putting them in the oven. Both turned out great, especially just baked and slathered in margarine. Most certainly a victory for us both. This has all been leading, as the best stories do, to a climax. Last weekend we had been invited to dinner by a good friend and I offered to bring dessert. My inspiration, as I leafed through cookbooks and the internet, was chocolate. 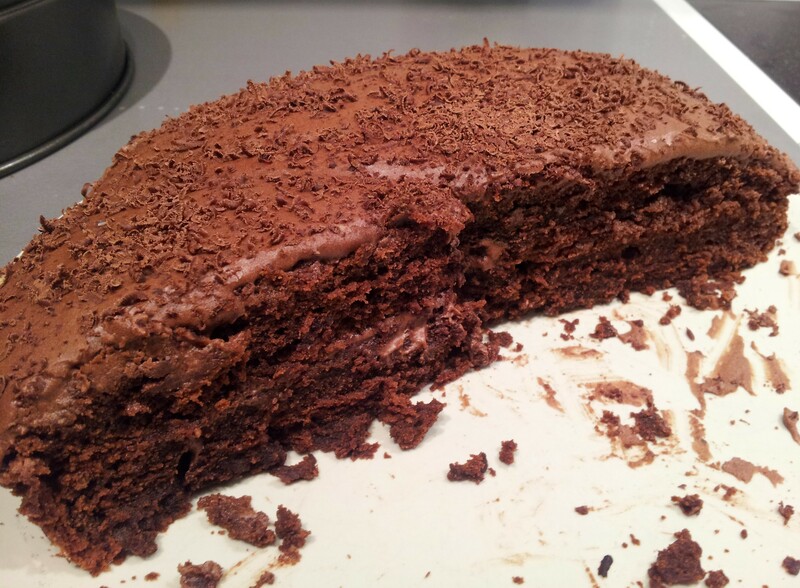 In the end I found a chocolate cake that was not only egg and milk free, but it had the word epic in the title. After recent cake incidents I wasn’t feeling confident and there were minor details that I could have done better (such as reading all the instructions before getting halfway through) but at the end, when I assembled it at the friend’s house and stood back to consider, I decided it was damn good. You should have tasted it. In fact, there is still some in the fridge now, if you’re quick! So I suppose what I mean to say is that I’ve found my own personal type of activity/therapy to while away the crawl to the day of least light. It requires practice and concentration, there is always something new to learn and I can pretend that watching The Great British Bake Off is studying. Plus we eat the results. I’d be curious to know what other habits or hobbies others are taking up to keep the darkness at bay. Whatever it is, may it be satisfying and keep you sane. During the past 3 weeks I have been to more bbqs than I would usually go to in a year, and incidentally, have eaten more sausages than I would usually eat in 6 months. 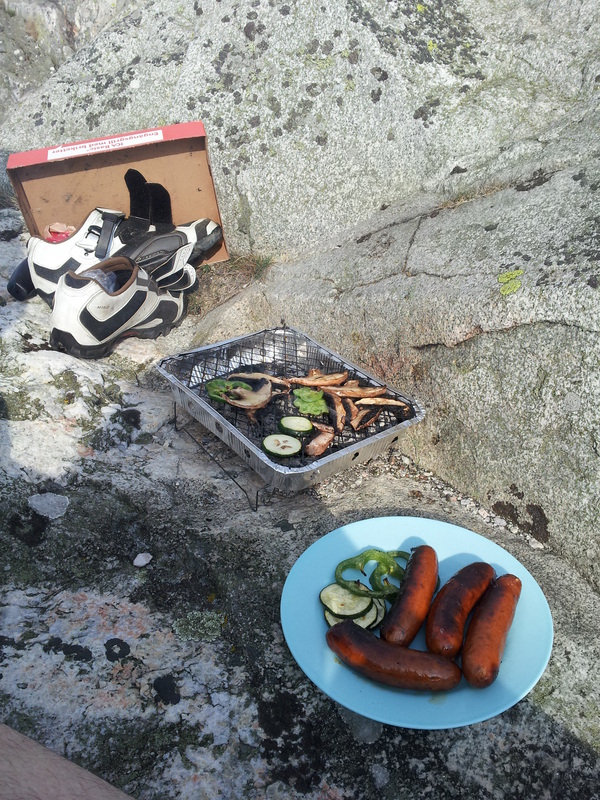 This grilling frenzy isn’t limited to our household either; it seems to have infected the whole of Göteborg. And what is responsible for this strange happenstance? Spring. 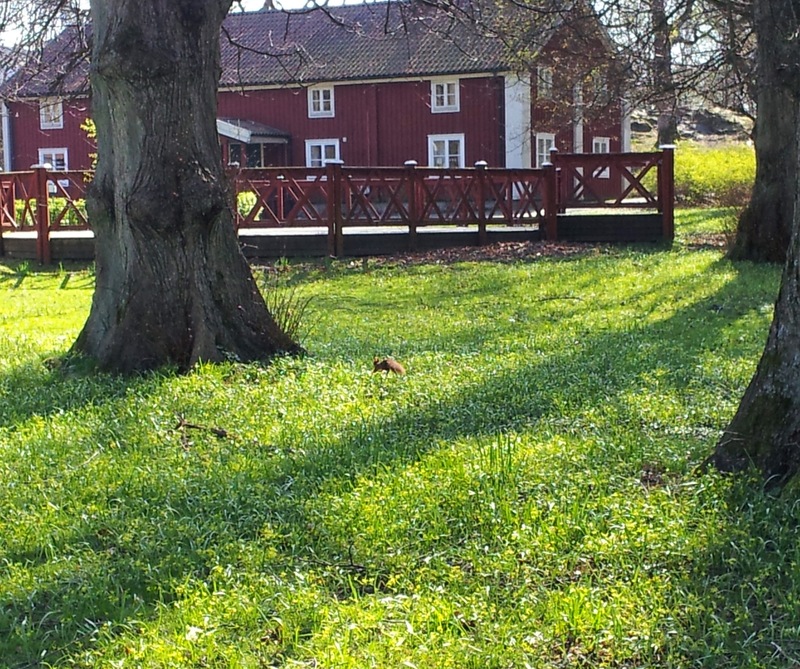 The last two weekends have been clear and sunny, and every place where grass grows has been covered in Swedes, from parks, the sides of canals, gardens and conveniently placed deckchairs. Many people are chatting with friends, some eating, but for the most part people are just basking in the sun. Though I come from a place that is known for sunny weather, I have never really enjoyed it as much as I have these past few weeks. Now I can bask happily, making up for the months of cloud, rain and fog, and hope to gather in enough heat to last before the wheel turns to winter. I have also been able to understand the meaning of the seasons since I have been here. In Australia we follow the European seasons; Summer, Autumn, Winter, Spring. As my homeland lies in the southern hemisphere the seasons are precisely flipped, so that Summer is Winter, and Autumn is Spring, etc… This isn’t the only difference that I have found however. While the march of the seasons is recognisable, in Australia it isn’t anything like the changing seasons in Europe. Not only rain and encroaching chill in Autumn and snow in Winter, but Spring… Well, it’s as though an enormous bucket of colour was spilt over the country. Trees that only a month ago were bare and stragledy are now heavy with light green leaves, and flowers of all colours and sprouting between trees, in pots and all over whatever grassy area they can find. First came the snow drops, tiny white bell-shaped flowers on the sides of footpaths and under trees. Next were stands of daffodils, then tulips popped up in gardens, mostly red and yellow. Most recent are the cherry trees and apple trees covered in masses of pink and white flowers, whose petals litter the city. I don’t know what will be next, but I’m looking forward to roses, especially in Trädgårdsföreningen. In addition to the opportunity for bbqs, the changing seasons also bring festive days. As with Jul, Easter is celebrated in Australia, but as with Jul I know understand Easter much better. When you’ve only experienced the slow cooling of Summer to Autumn, and the only rebirth around is the sudden rise in chocolate sales, I don’t think I ever truly understood Easter. Having lived through the end of Winter and watched green return I now know why there is a festival of rebirth at that time of year. I also better understand the excitement of the 1st of May. One festival that I hadn’t really been aware of was last Wednesday, the 30th of April; Valborg. I had been confused about the name of the day and then continued to confuse Swedes by asking what it meant. Mostly I got blank faces, and someone realising that it was his fathers birthday and rushing off to call him, until someone brought out their smart phone. It would seem that it has something to do with Saint Valborg, and for some reason students wearing white hats. Valborg seemed to me a strange name, but what do I know about Scandinavian names. I’m still not convinced about Knut for example. Then the bbq continued and I forgot about strange names, and missed the Chalmers University parade (featuring Putin, North Korea and Ryan Air – they are students after all) and the bonfires that were burning throughout the country. 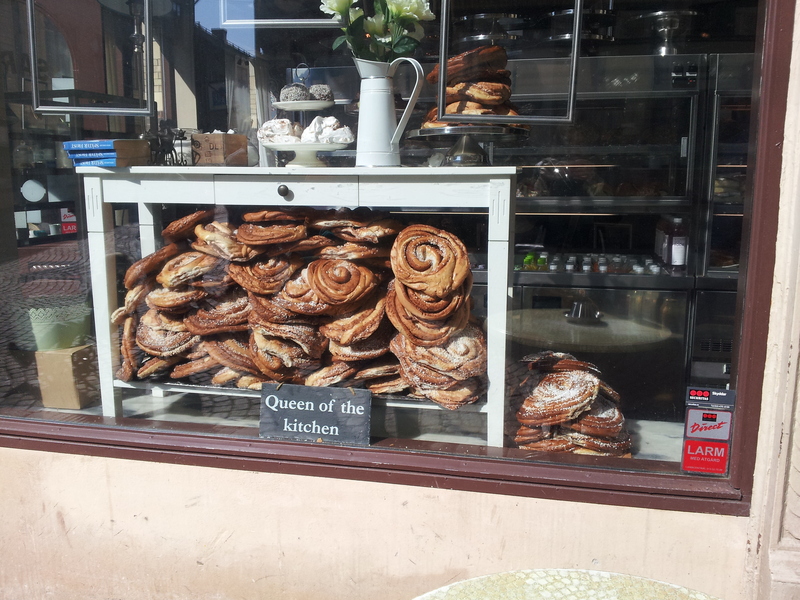 The next morning I woke up and thought I’d do a bit of blogging, and looked up Valborg. 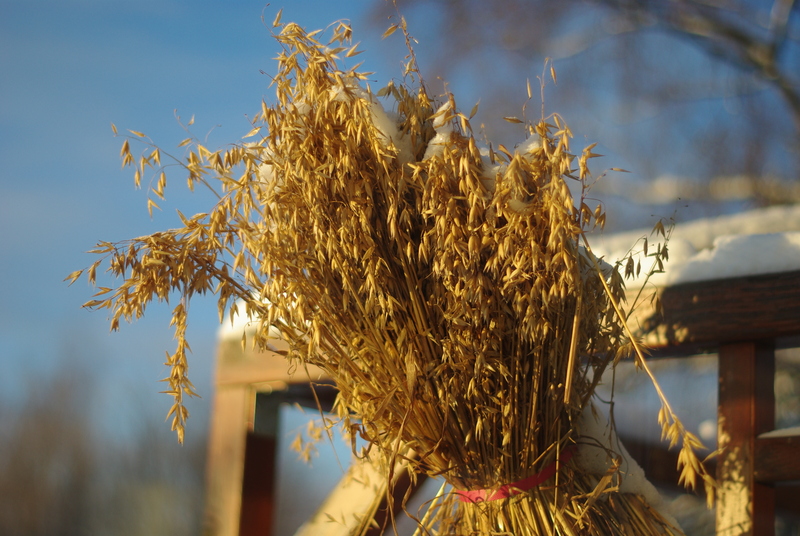 Like every other northern-European festival it can be traced way back to pagan traditions. It used to be called Walpurgis (and probably still is in some places) and was a celebration of the change from Winter to Spring, as well as the time when the barrier between the world of the dead and the world of the living was at its weakest. It then transformed into a celebration of the saint (coincidentally with a similar name) and her power over witches and representatives of the old religions. Now only the bonfires, traditional songs and parades remain, a link that has been altered but not broken since before written memory. 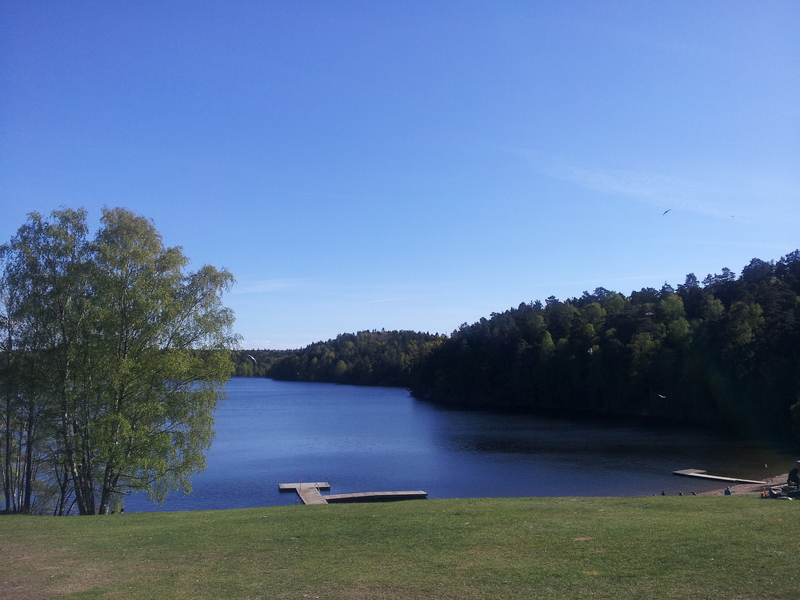 Another wonderfully Swedish day was yesterday, the 1st of May. 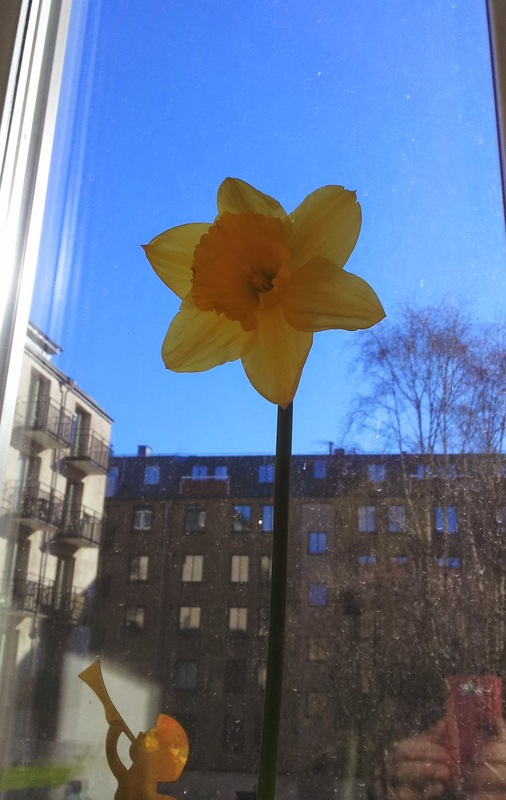 Not only was it the first day of Spring but it was the Swedish equivalent of Labour Day. All over the country crowds gathered in squares to protest. Protest against what, you ask? That seemed to depend which party you’re inclined towards. As I was at a bbq (of course) I didn’t see any of them but I did hear that the Social Democrats were supporting the change to a 6 hour work-day and the Feminist Initiative were protesting against racism. It also explained why our bbq spot was so very quiet – on such a fine day only traditional festivities could pull Swedes away from picnics and basking in the sun. As I write, the sun is shining, the wind of blowing, and teenage girls are screaming on the ride at the recently re-opened Liseberg. Spring has arrived, and the country has come alive again. While spring has most definitely sprung in the west coast of Sweden, winter is still clinging to the valleys and mountains in the heart of Norway. On our train ride north from Oslo two weeks ago, winding through valleys as it followed a river for most of the way, it felt as though we were travelling back in time. Tiny pockets of snow gradually grew into piles and drifts, and ice spread its sheets over the river. At our stop we were met by a cousin of my mother who for the sake of brevity I’ll call my aunt. 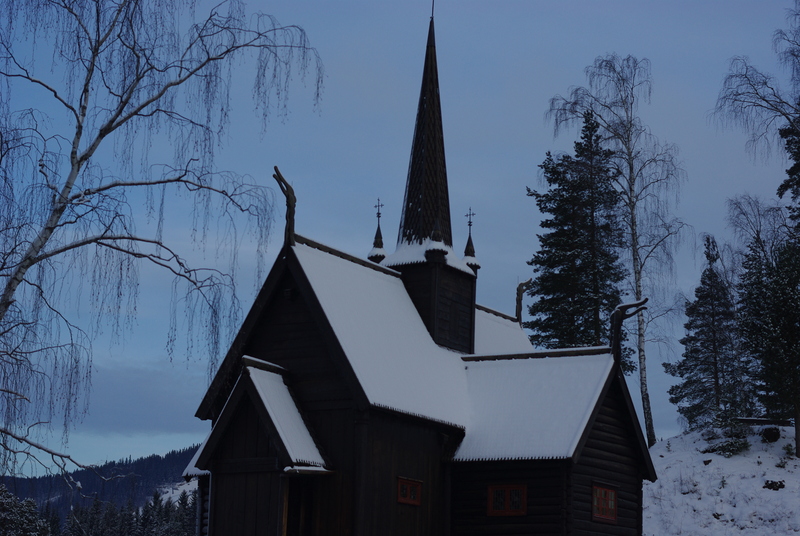 We’d met her and her family in January when we visited Lillehammer, and it was as a result of that meeting that we were being driven up to a cabin on a mountain to spend a weekend Norwegian-style. The road up to the mountain had been the site of an avalanche the year before, and it was still scarred, with many sections of road having been relaid and the riverbeds still full of the stones and earth that had been torn from the hills. It had happened at the end of winter, when the melted snow had come rushing down the valley, and had also taken a few houses with it. Luckily no one had died, but it did serve as a reminder of the massive forces at work in the mountains. Seeing the land up there, I can understand the old stories of trolls and giants, because what else could explain the tumbled boulders and steep valleys that seemed hewn by an indiscriminate hand? 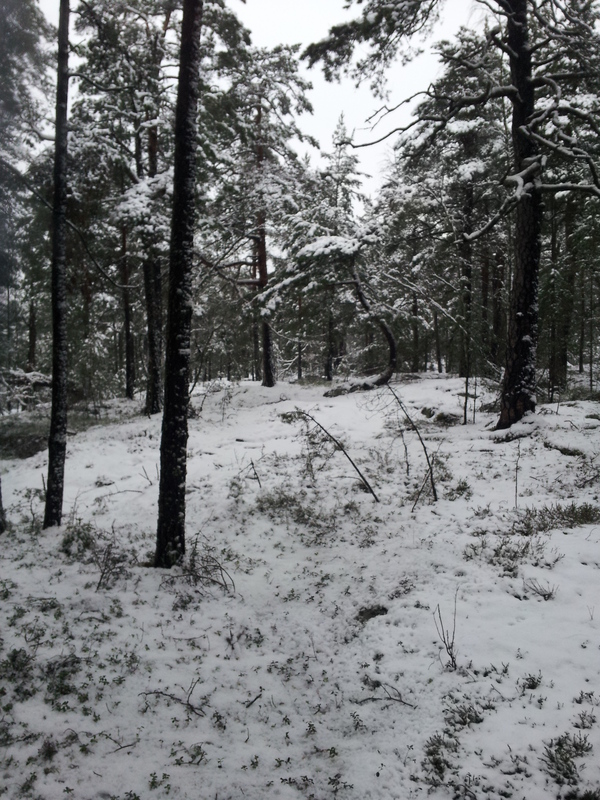 We soon reached the cabin, nestled among a few pines and birches and at least half a metre of snow. Behind it loomed a snowy hill, and behind that a row of mountains peeping out of the clouds. My partner and I managed the feat of simultaneously losing one leg up to the knee in the snow as we walked from the car. From then on we were careful to stick to the path of hardened snow, and only went out with only shoes one other time, which was when we left. 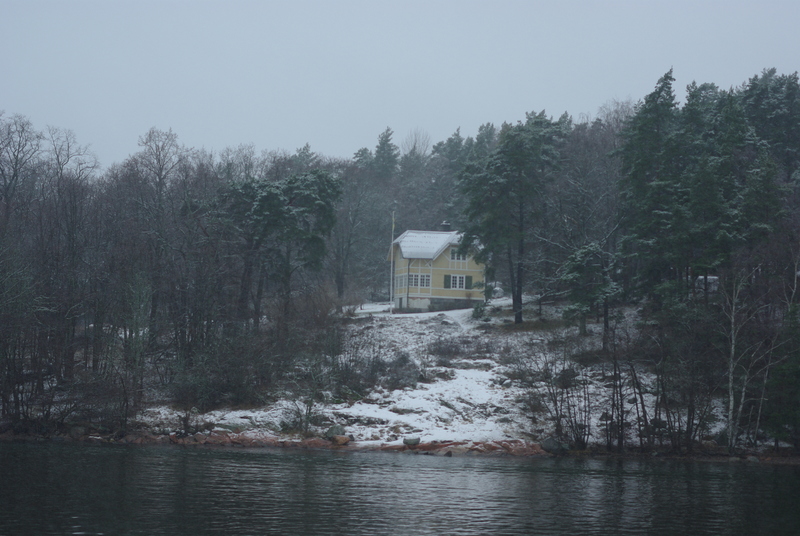 The cabin, or ‘hytta’ became exactly my ideal image of a winter cabin. Made of pine in the traditional style, it was cosy, warm and spacious, and I instantly felt comfortable and at home. My aunt’s husband, who we had met before, greeted us at the door and we were then introduced to my aunt’s mother, who was very tolerant of our attempts at speaking Swedish and our inability to speak Norwegian, and who also partook of the beer and wine that was shared around as we settled in (and also when we got ready to eat, when we ate, after we ate, when we came back from an excursion outside, when we prepared for another…). As we had arrived in the evening we then had dinner, and out of the windows we could see ‘the blue hour’ settled on the snowy hills behind the cabin. In April it usually happens around 9, when the sky is clear and the sun has just sunk below the horizon. The whole world seems to glow with a deep blue, and then slowly fades to darkness. The next day we got up not particularly early (it being a holiday) and after a thorough Norwegian breakfast we bundled ourselves in warm jackets and ski boots and headed out to enjoy the sport that Norwegians are raised with. The snow was a bit sticky, but we were soon on our way along a track, my partner falling a few times and then getting the hang of it and myself falling a few times but never quite finding the glide. 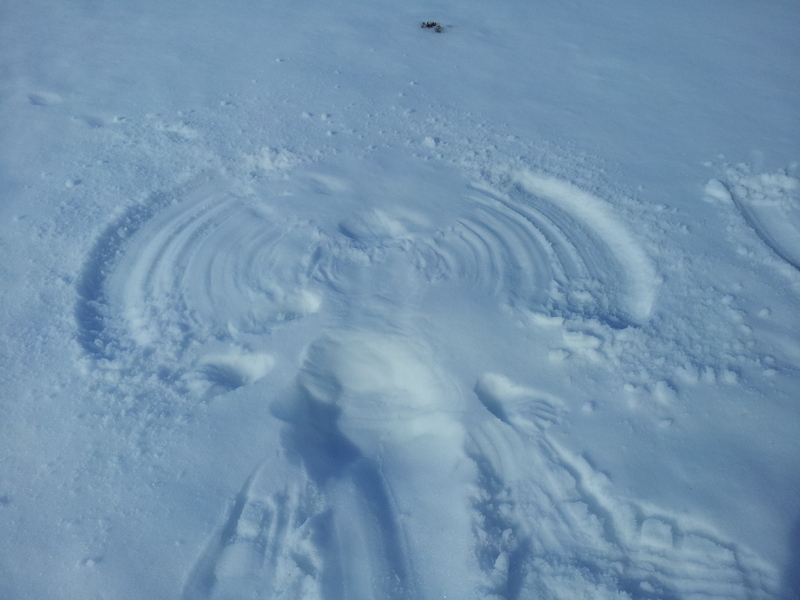 I could manage to shuffle along but I think I’ll need further practice to be able to fly over the snow. Particularly up in mountain cabins, oh yes. After a few hours we headed back and needing a bit of food after our exercise we had a bbq. Unfortunately the snow was a bit heavy to use the outside bbq, but we made do with sausages roasted in the fireplace, wrapped in potato bread and followed down by beer. We then did the traditional nap, curling up to read or snooze as the afternoon passed. 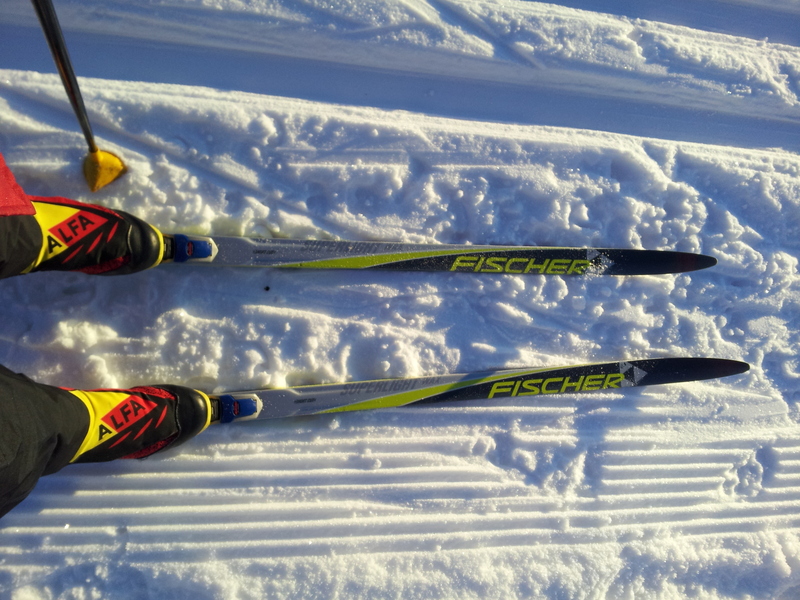 I had noticed when we’d been preparing the skis that there were a pair of what looked like snowshoes on the verandah, so I asked my aunt about them and soon after we were trudging across the snow, mostly managing not to step on the soft snow and lose our footing. We did the obligatory snow angels and explored the covered woodlands. By the time we came back the water for the shower had been heated and my partner had enjoyed a shower, so I took my turn. Knowing that the water had been pumped by hand outside and headed in the laundry kept the shower shorter than normal, and as a result I felt even more refreshed. I was also a bit tempted by the sauna but I wasn’t sure if that would require a dip in the snow to balance out the heat, so kept that to myself. 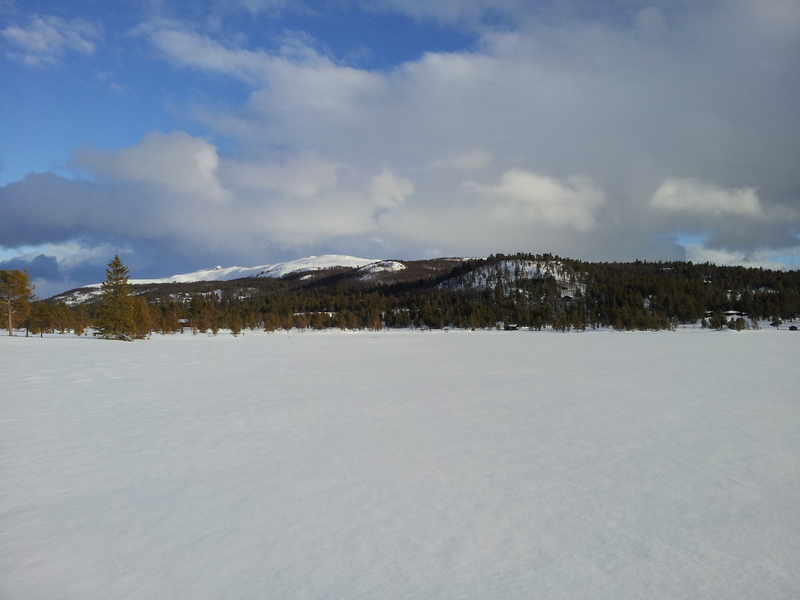 Cleaned and refreshed, I then encouraged my partner to join me for a walk on the snow, heading for the frozen lake I had seen earlier. 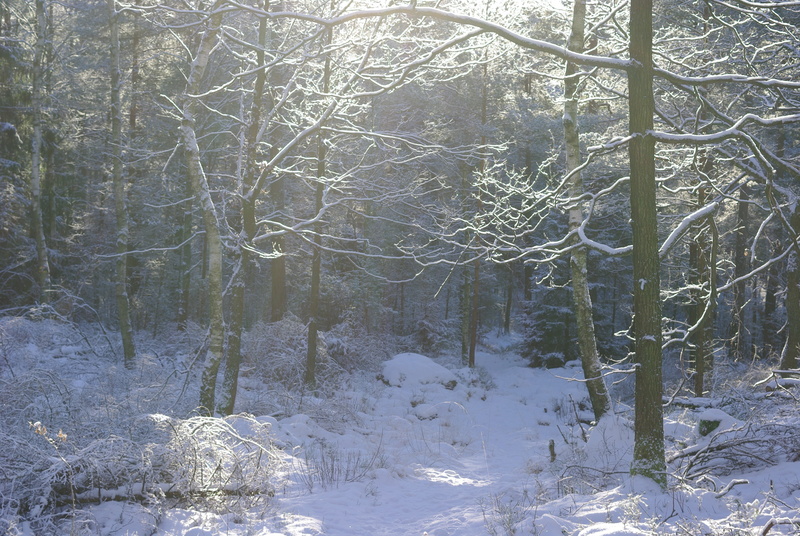 The sun was starting to go now by this point, so the light and shadows were stunning, the trees almost seeming to glow amid the smooth white drifts. 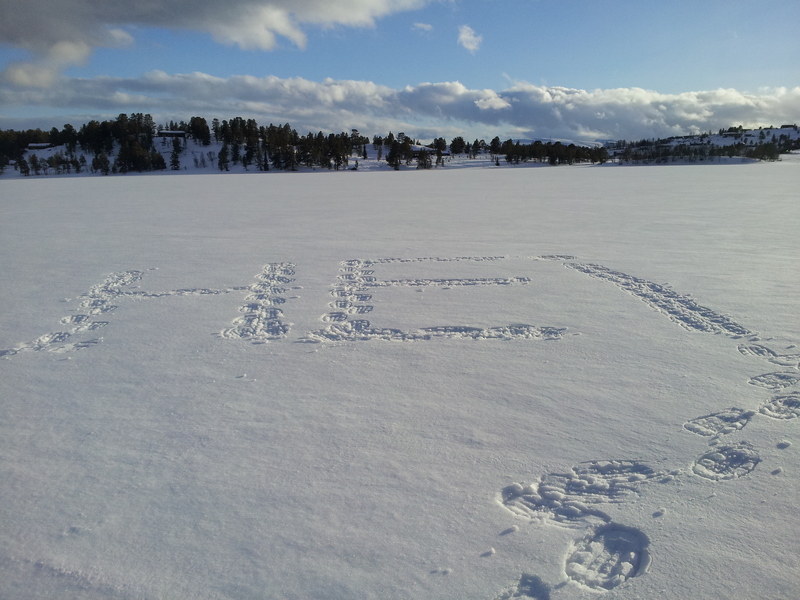 I took the pristine smoothness of the lake as an invitation to leave a message, in Norwegian of course, and realising that the appointed hour for dinner was approaching we headed back to the cabin, slowed down by gazing at the scenery and occasionally losing a foot or two. Dinner and dessert went long into the night, in Swedish, Norwegian and a bit of English, and before we knew it our eyes were growing heavy and we headed of to bed for the last night. We awoke the next morning, and as we got ready for breakfast I was already starting to miss the view of snow skirted trees and distant mountains. After a hearty traditional breakfast, including expertly wrapped sandwiches for the journey, we gathered by the door with our luggage and sadly said goodbye. Two weeks later I can remember the crispness of the air and the sparse beauty of the snow covered hills, and at least for now the scent of pine still lingers on my woollen jumper and scarf. I hope that we’ll be able to see the cabin in summer, to cycle along the ski tracks and paddle in the lake where I wrote a message on the ice, but if not at least I know that winter lingers for a long time in the mountains. Last weekend I tried skiing for the first time, however unless there is an event for slowly sliding backwards down a snowy slope while saying ‘Oh dear’, I fear I won’t be participating in the winter Olympics this year. 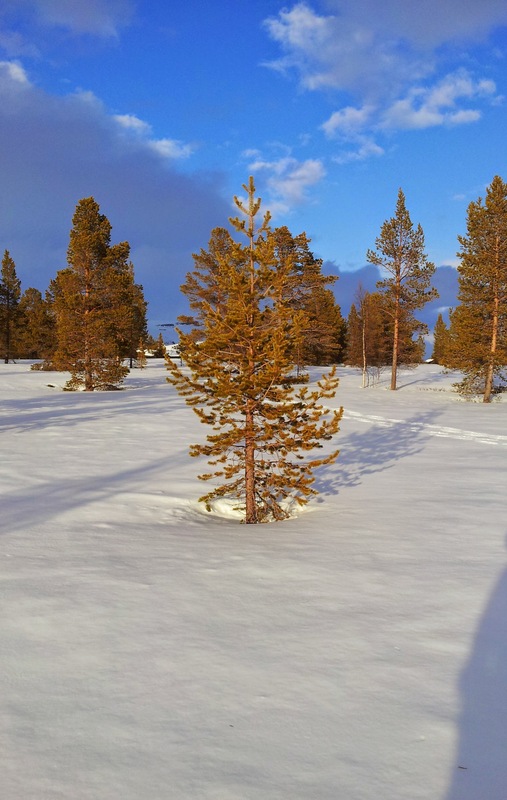 I’ve long entertained romantic images of myself gliding easy across snowdrifts, looking around at trees and stunning vistas and have been looking forward to trying it out while we’re here in Scandinavia. My partner was even more enthused, having been snowboarding before and eager to try again, so when he found a ski park not far from Göteborg, the plan was set. We headed off with two friends, bright and early, though were discouraged by the recent rain and the iciness of the snow that remained. On our arrival we found that the snow had been iced over and was very slippery, and as we waited for the park to open we weighed our options. There were no lessons available and these weren’t the ideal conditions, but nothing it seemed could prevent my partner from unleashing himself upon the slopes. His first attempt on the little slope was, well, his first attempt, but eventually he set off up the bigger slopes and was soon gliding happily down, hardly ever on his back. 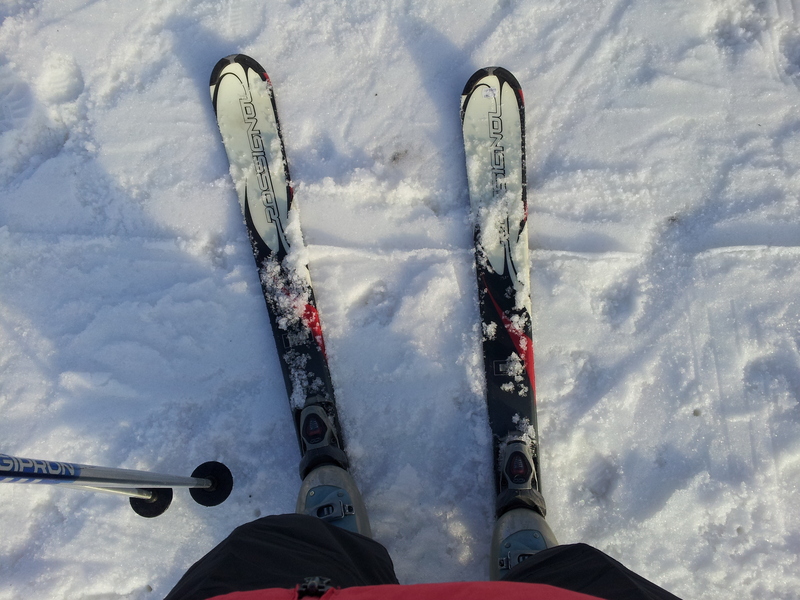 Meanwhile I decided to have a go and got myself decked out skiing gear and had my first try and skiing. Not quite graceful gliding, but after much concentration and effort I did manage to move forward. One of the friends who had come with us joined me and we set to, slowly climbing the little slope and then trying to work out how to stop or turn as we sped down again. By observing others (mostly around the age of 5 in our area) I worked out the basics, but each attempt at stopping or slowing down resulting in shooting off to the left. An attempt from the pinnacle of the little slope resulted in sliding into a pole and gradually making my way down while trying not to go tearing off into the lifts. At the end of the day, though, much progress had been made from knowing nothing, though a descent from the taller slope was still out of the question. Next time I would like to try cross-country skiing, which I imagine would involve fewer slopes. Also lessons. Other than adventures in the snow, this last week has been primarily focussed on preparing for a Swedish test on Wednesday, and another next Wednesday. This week’s was in preparation for the other which is much more important, and to show us and the teacher what we need to be focussing on. For me it was mostly writing. It seems sort of odd to me now as I happily type away that stringing words together is such a struggle, but someone the rules don’t seem to penetrate. What I need to do, I think, is divorce the forming sentences from all English grammar and think only in term of Swedish. Subjekt – Verb – Objekt. Q-ord – Verb – Subject – V2 – Objekt. Adverbial – Verb – Subjekt – V2 – Objekt. Still they are rules, floating above the forming ideas, not implanted yet. More practice is needed. 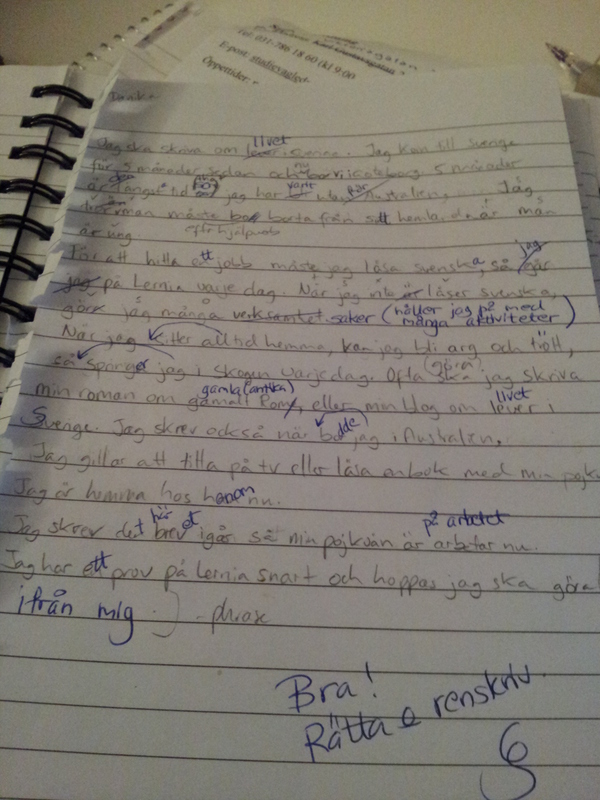 Perhaps I should write an update in svenska någon tid? För en publik av en. On the subject of writing I have also managed recently to finish a short story, the first one I’ve finished in over a year. Yay! It is currently being read out at the finest writing centre in the world (who me, biased?) by an obliging friend and getting good reviews and critiques. 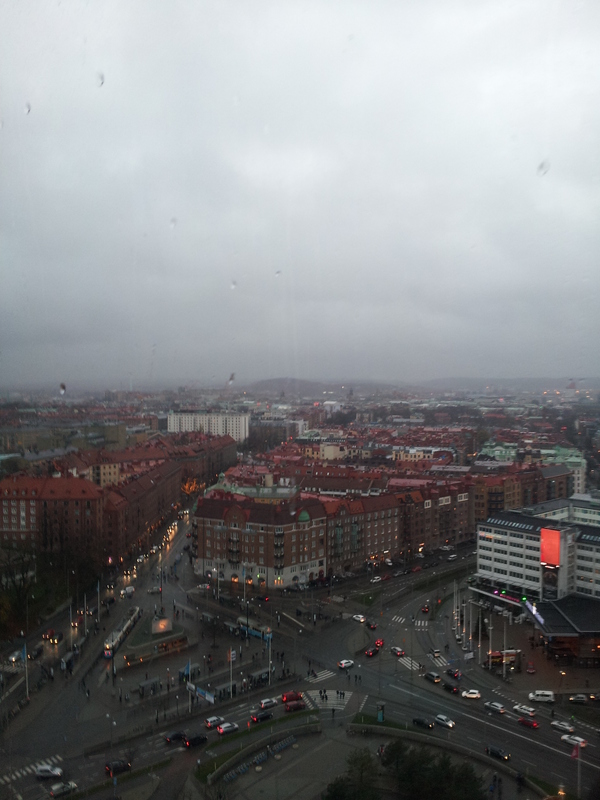 Which makes the distance between Göteborg and Greenmount Hill seem not so vast. I have learnt something very important these last few weeks, which is extremely pertinent to my life in Sweden. 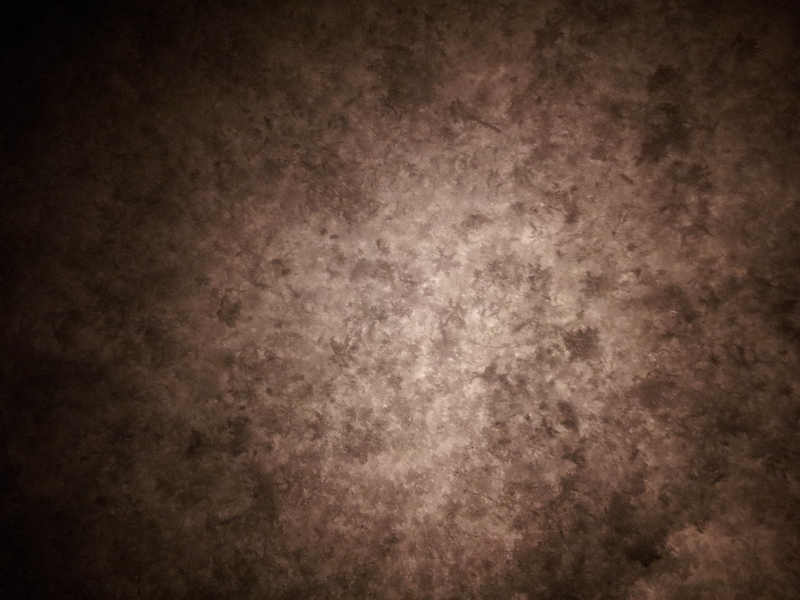 I like the fluffy dust heaping on the street, the crunch as it compacts and the pristine sheets it leaves wherever it falls. I especially like when it drifts down in fat clumps, sticking to my hair and revealing the star shapes I’d thought needed a microscope to be seen. I also enjoy what it isn’t: rain. Only the first rain of summer, back in Australia, compares to the glee and staring about that instantly mark me as a foreigner. 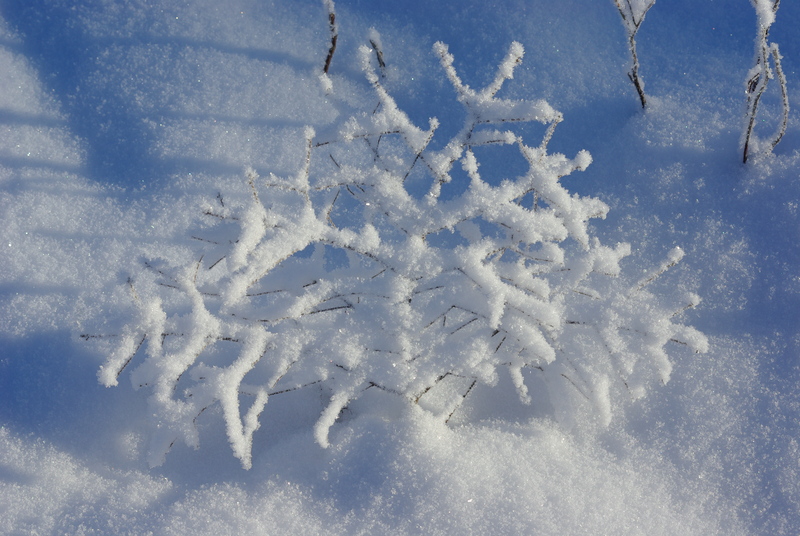 This last week is had continued to fall, though the tramping of feet, strewing of salt and fineness of the snow means that it isn’t anywhere near knee height yet. Watching the snow build up is a part of a life far away that I hadn’t considered before I left, namely the seasons. Australia, at least in the south-west, has two seasons. Hot and dry and wet and cold. 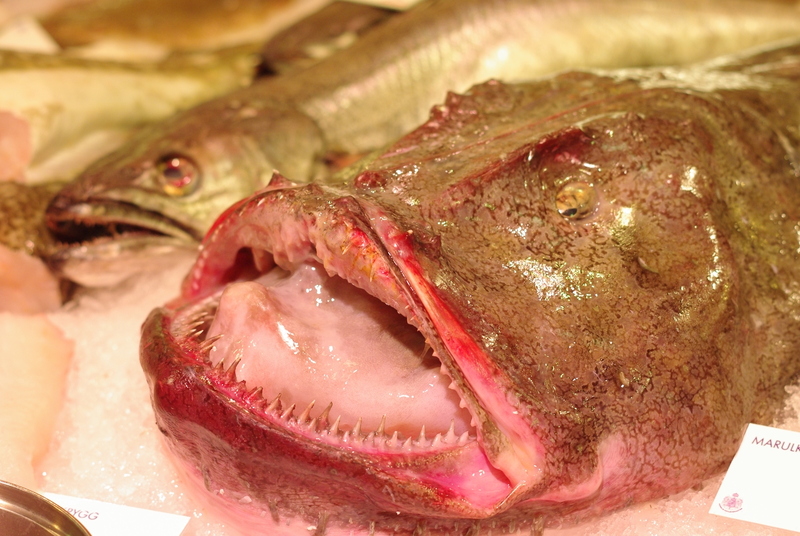 Whereas Sweden has a whole host of them, 3 of which I have experienced so far. Since our arrival in late August green turned brown, the long days shortened and clouds descended. It was dark, and cold for a while, almost claustrophobic, though lit by stars in windows and candles. 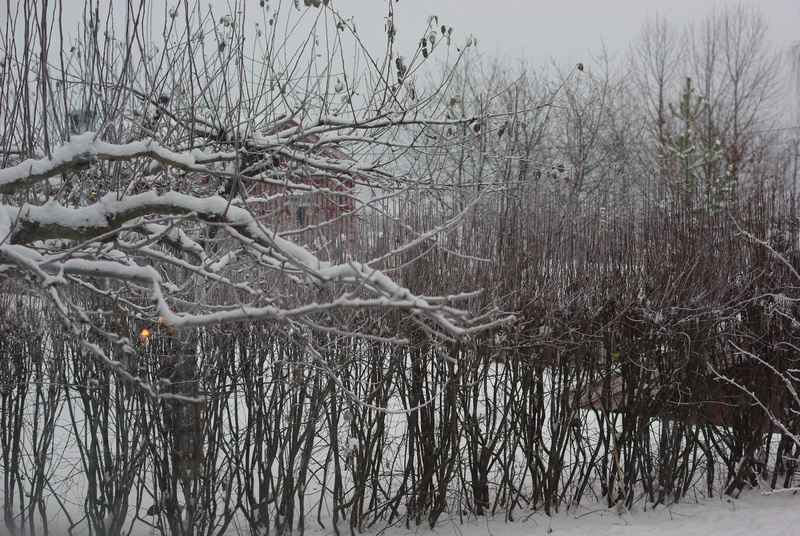 Then snow came in a burst and returned later in earnest, coating the world outside almost to monochrome. Next I suppose the rain will come, the snow will turn to ice and slush (bleagh) and slowly brown will turn green again and I can stop wearing thermals, a thick jacket and my small army of beanies, gloves and scarves. Then the whole cycle will continue, and no doubt I’ll eagerly anticipate the first drifts of snow. So other than gazing about at the weather, what else have I be doing since the last update? Well, not very much really. I’ve been going to classes and studying, occasionally going out and wondering how on earth I’m going to find a job. The only event that really deserves a mention is Sunday, which as many of my readers will remember, was Australia Day. This far from home I felt disconnected from the usual umming and aahing about Invasion Day and Survivor Day and post-colonial guilt, instead revelling a bit in stereotypes that I would have shuddered at previously. We had been invited to a bbq arranged by an Australian friend, and tromped over bearing sausages, beer, wine, a koala shaped hat, an apron emplasoned with images of Perth and subtly green and yellow clothes. At the party were more Australians than we’d so far met in Göteborg, and after chatting and snacking on traditional food (sausage rolls, shapes), we realised that our time here has been quietly changing us, so that in a strange way be felt a bit like outsiders. Possibly we need more exposure to Australians, or maybe it was because they were all from the eastern states. None of which took away from our enjoyment of the day, which also involved the very slow cooking of our sausages on a bbq that had been recently cleared of snow. Before I sign off for another week I feel I ought to mention that last Monday made it 5 months since we arrived in Sweden, and I will have to report back in a few weeks as to whether I have managed to wrap my head around the idea of being here for 6 months. Time is a funny thing. While I’ve been attempting to stuff my brain with a new language, writing, looking for a job and working out titles for my blog posts, my partner has been working very hard at his job. Even over the Jul break he put in hours, returning to the office for a day just after Jul and monitoring processes from our hotel room in Oslo, and so his boss decided he needed some kind of thanks. Which was how we ended up walking a bit hesitantly into one of the 4 Michelin star restaurants in Göteborg, being offered a glass of spiced apple juice, escorted to a neat little table and subjected to 4 hours of amazing food, service and drinks. It was indeed a difficult cross to bear. 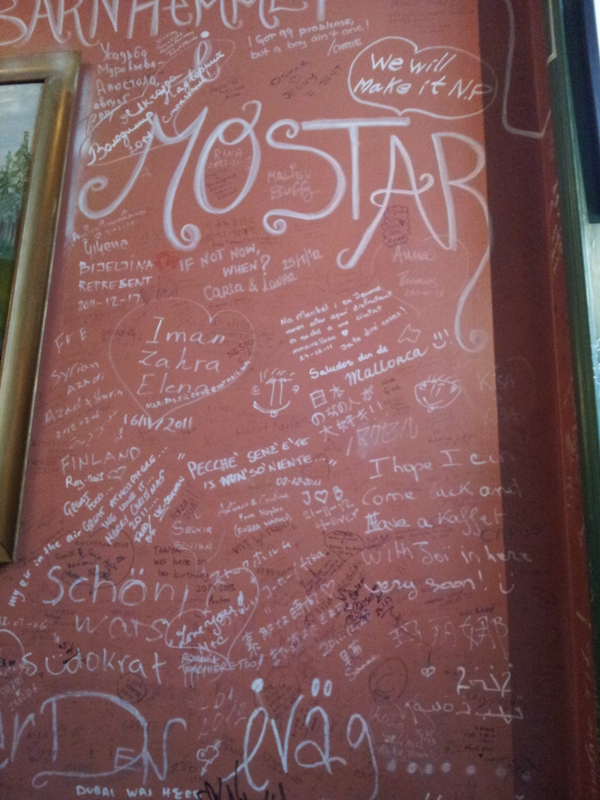 The restaurant in question was Thörnströms Kök, and at this stage I have to come clear about something. I have never been to a restaurant classified as ‘fancy’, so was prepared to be impressed. It didn’t take long for this to happen. I’m no gastronome (gastrognome?) so I can’t list the food we had, but suffice to say we chose a set menu and matching wine list, and everything was perfect. The wine matched the food, each (somewhat, and expectedly small) meal was a feast of flavours and they kept foisting appetisers and sweets on us. We made a bit of a miscalculation when we ate all of the bread that was intended to last the entire sitting before the second course arrived, but they were happy to bring out another. More impressive even than the tastes and expertise was the uncanny ability of the staff to have the next course and wine on our table just when it was needed, and to my personal amusement, their habit of refolding the napkins while we were taking toilet breaks. I left mine intentionally folded but was foiled by the waiter’s superior skills. By the time we had been there for 4 hours and I had finished a pot of a newly invented herbal tea combination, we were satisfied and ready to venture out into the cold for the slow plod home. If you get a chance to go there, go. In addition to me now having an unrealistic benchmark for future meals, winter has finally actually arrived. About a week ago the snow came, which I mentioned in my last post, and has remained. The first day I stepped out into the now consistently -C temperatures, my breath caught in my throat, and I have resigned myself to wearing thermals whenever I venture outside and a minimum of two beanies. It has stayed cold enough that there has been hardly any slush or ice, so I make my way around town with enjoyable crunching sounds from beneath my boots. Last weekend we were lucky enough to get two days on sunlight and it was glorious. Though still cold the white snow and sharply contrasting shadows were beautiful and worth any amount of numb fingers. That weekend we also went on a short trip up to Trollhättan, a town about 40 minutes north of Göteborg, and where one of my partner’s workmates lives. We were greeted at the train station by piles of snow and said workmate and his daughter, who was gleefully being dragged along on a small sled. She’s about 3 and with her father’s encouragement exclaimed now and then in English, and the rest of the time squealed with excitement when he whipped the sled around in a circle or through deep snow. I very much wanted one, which was not helped when he mentioned that he sometimes attaches the sled to his bike to take her to day care. I tried sending significant looks and less subtle hints to my partner but thus far he has refused to bite. We were then taken on a tour of the town, including a cafe stop and a visit to the locks and canals that connect the west and east of Sweden and provide the area with power. A large patch of deep snow in which the little girl demonstrated how to make a snow angel required me to do the same, and was only part of the capering about that my partner and I go into. We had a long of time to make up for from our childhood. After looking into the fast flowing canals that rushed towards the hydropower plants and exploring more of the area I discovered my phone was no longer in my pocket. 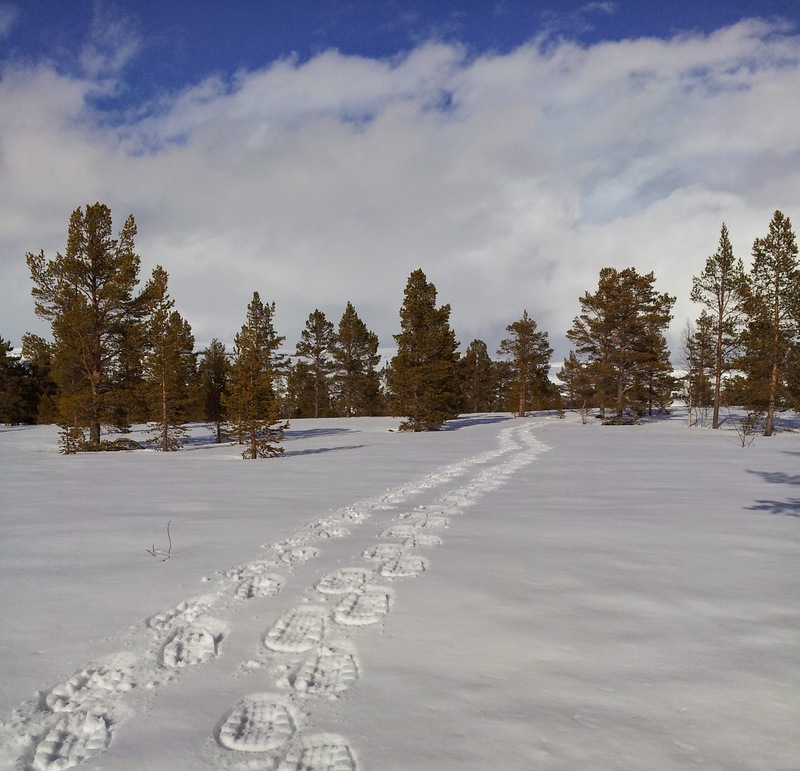 We backtracked, my partner repeatedly calling my phone and the rest of us peering into tiny holes in the snow. It seemed likeliest that it had slipped out while I was capering, and as we wandered through a deep patch I heard the ringtone. After checking that I hadn’t somehow missed it in one of my pockets I dug into the snow and found it, wet, cold and loudly playing the theme to The Hitchhikers Guide to the Galaxy. Relieved and starting to get cold, we then headed to our tour guide’s home, where we were supplied with whiskey and wine until it was time to head home. As the workmate is a self taught connoisseur of whiskey we were quite merry by the time we left. The next day we followed up the traditional playing in the snow with a visit to Ikea, carrying a list that I hoped and inevitably failed to follow. We did get what we needed, in addition to a number of things I hadn’t realised we needed, and it confirmed my suspicion that Ikea in Sweden is a clone of Sweden in Australia, or wherever else they have sprouted. Since then we have worked and studied, waiting for the weekend and the rare days like today when the sun shines on Göteborg.